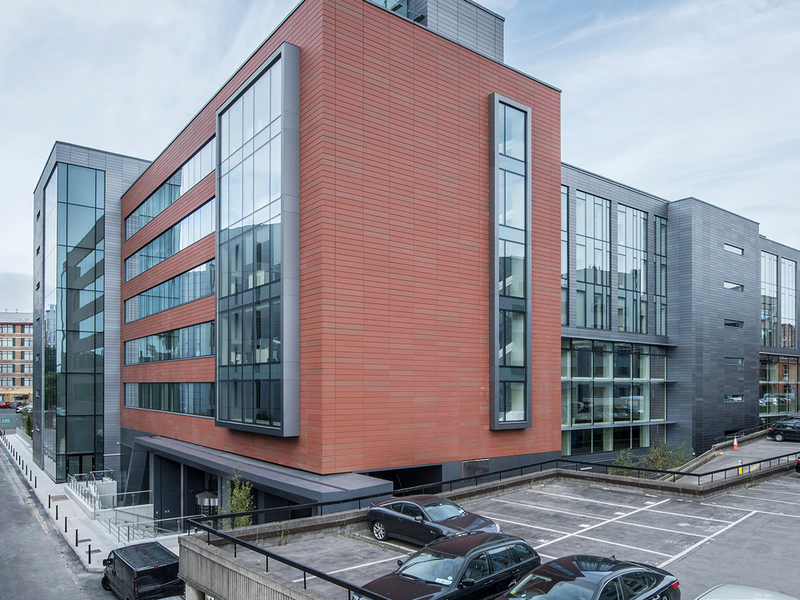 Located in Dublin’s SOBO District, the development at 1WML is comprised of a new 6 storey over basement office building with a floor space of 16,500 m² and a 4 storey residential building with retail space at ground floor. The Office entrance is located off Windmill Lane and is visible from Sir John Rogerson Quay. A 19th Century grain store, no 19 Creighton Street has been retained on the site and creates a dramatic backdrop and entrance feature to the main office foyer, which is a 650 m² double height space that can be sub-divided into a large town hall space for “All Hands” events and a separate foyer space. 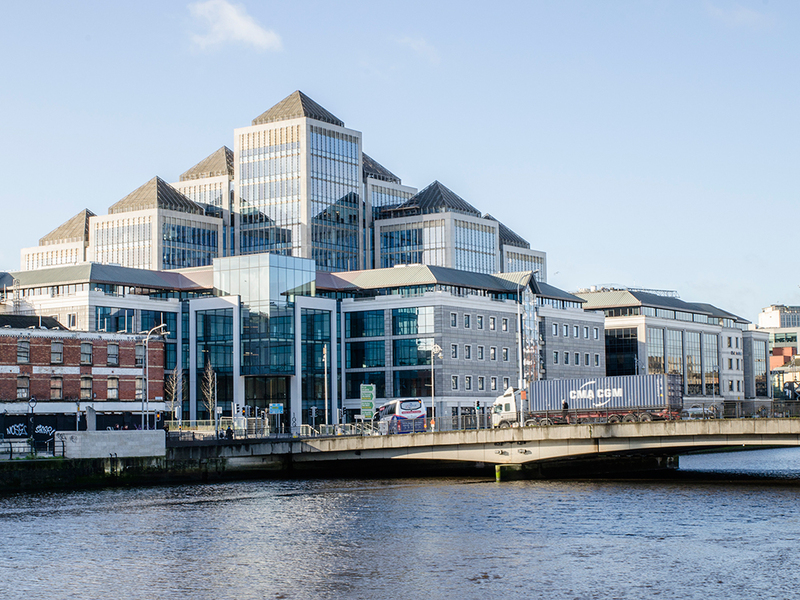 The project is constructed to LEED Gold standard and provides unrivalled commercial office space in Dublin’s Docklands. Bennett Construction was the Design and Build contractor on Dorset Point Student Accommodation. Located at Dorset Street Lower, the project consisted of 447 student bed spaces over 102 clusters in five blocks ranging from four to six levels high (including a basement plant room in Block C). The development included communal kitchens, break out spaces, launderette, cinema, and reception and secure landscaped external courtyards. 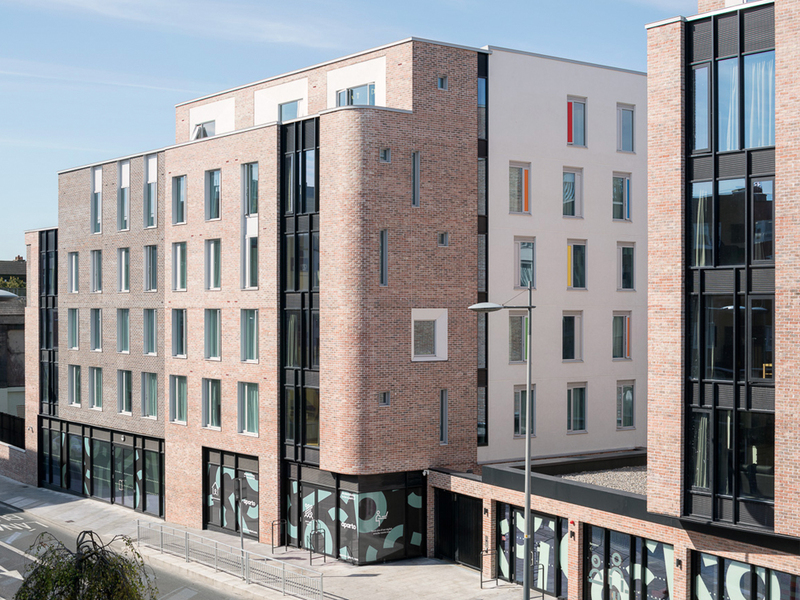 The successful delivery of the second Student Accommodation development to an exacting standard marks a real success for BCL. It has been instrumental in the establishment of BCL as a solid provider of high quality student accommodation in the Irish market. It was delivered to an extremely tight timeline, to exacting standards and is a shining example of quality, which is an integral part of the project delivery process for BCL. This project involved the construction of a 6 storey (13,700m2) over double basement (4,500m²) Grade A office block. Sisk constructed the shell and core under a separate contract, which overlapped with early access fit out. The site is a city centre site with streets on two sides and 4 Georgian buildings on the remaining side, which were restored and refurbished also by Sisk. The fit out consisted of raised access floors, SAS ceilings, BENE glazed/pre-finished partitions. The floor layouts are 80% cellular except for the 6th floor with multiple meeting rooms for client and executive meetings. A key outcome was the availability of floors as early as possible for Arthur Cox fit out and move in. 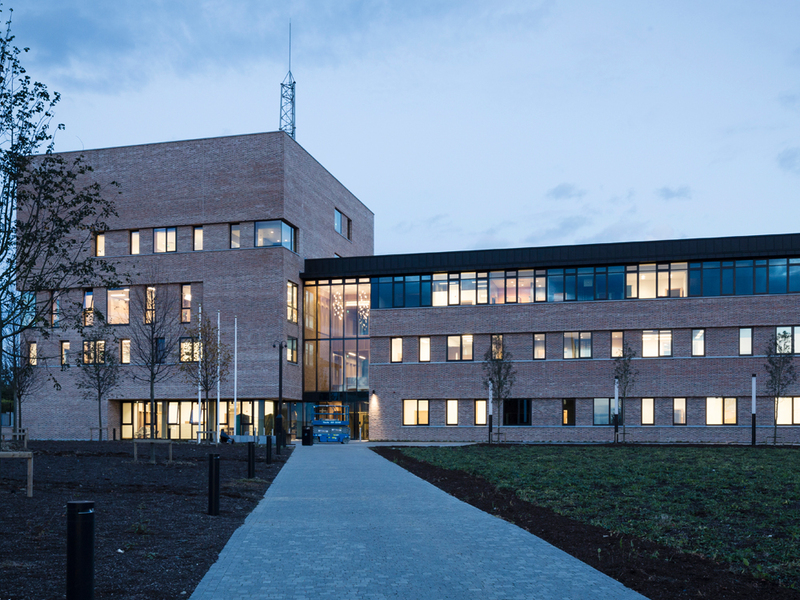 The project, which was built by Duggan Brothers involved the development of a new divisional Garda Headquarters (circa 4,000m2) for Wexford Town. The site was a brown field site, which previously contained a malt distillery, which was demolished prior to Duggan Brothers commencement on site. Approximately 440,000 bricks were used in the construction of the project. There were significant logistical, structural, architectural, environmental and resource management techniques required throughout the project which caused staying inside the parameters of the project schedule challenging. These challenges were all managed by use of a collaborative approach between the Design and Construction teams that planned, understood and resourced the works efficiently. The implementation of this approach throughout the project reaped positive results for all of the team involved. The Internal Joinery was a very large element within the building. The main joinery elements were Oak Ceilings, Wall Claddings, Floors, Doors, Screens plus Window and Door Linings. Duggan Brothers also had to consider as to how each joinery element would impact on the other and ensure they all blended together as seamlessly as possible. 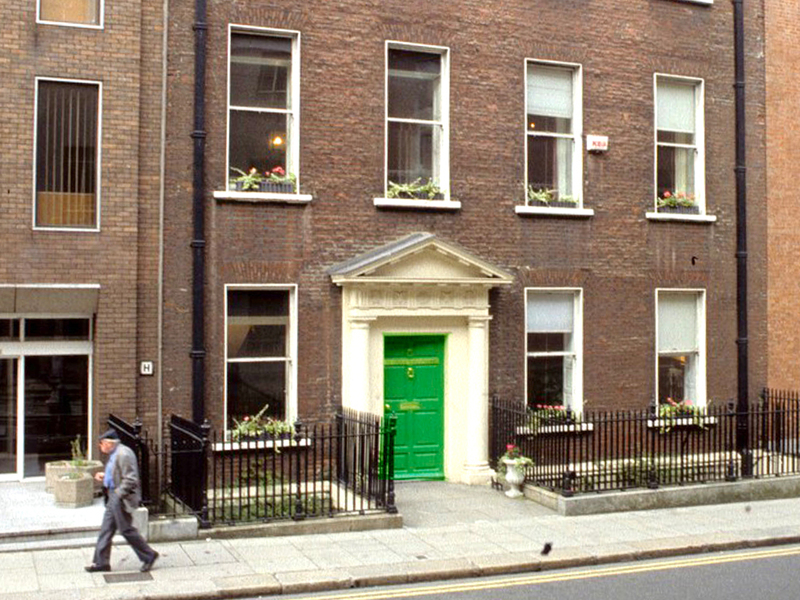 The building is located on Molesworth Street and connects through to School House Lane, taking up the gardens of the adjoining building onto Molesworth Street. A new 4-storey over basement office accommodation was constructed following works to the existing build, the demolition of all buildings to the rear and included a reduced level dig to 1 basement level. 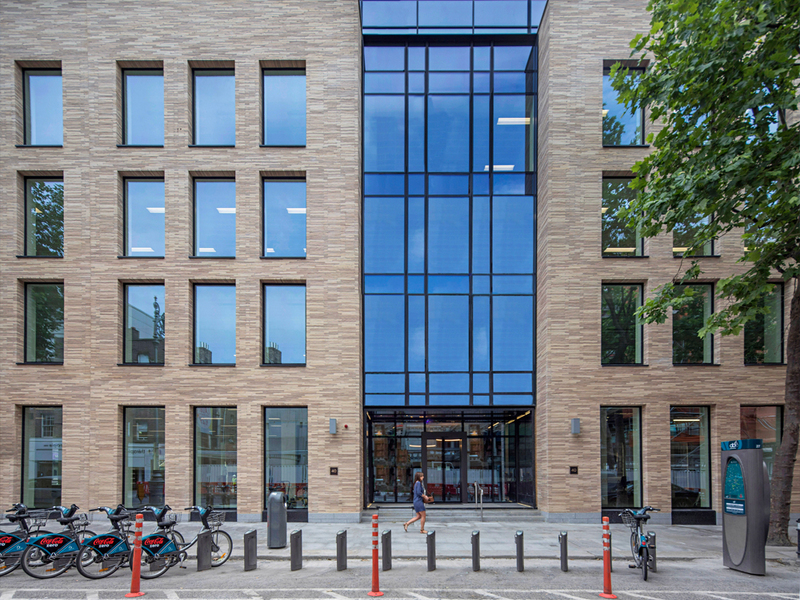 The project included glazed atrium to internal landscaped courtyard, CAT A fit-out to landlord areas, construction of new ESB substation, installation of car lift to basement and two new passenger lifts. In addition to conservation and full internal finishes to the existing building, reclaimed features were included within the new extension. The building has achieved many best in class energy innovations. At design stage extensive analysis was undertaken to deliver a highly sustainable building. The project joins a select group of innovative buildings that have demonstrated their commitment to sustainability in Ireland. This project consisted of the construction and fit out of a three-storey commercial 4,162m² office building. 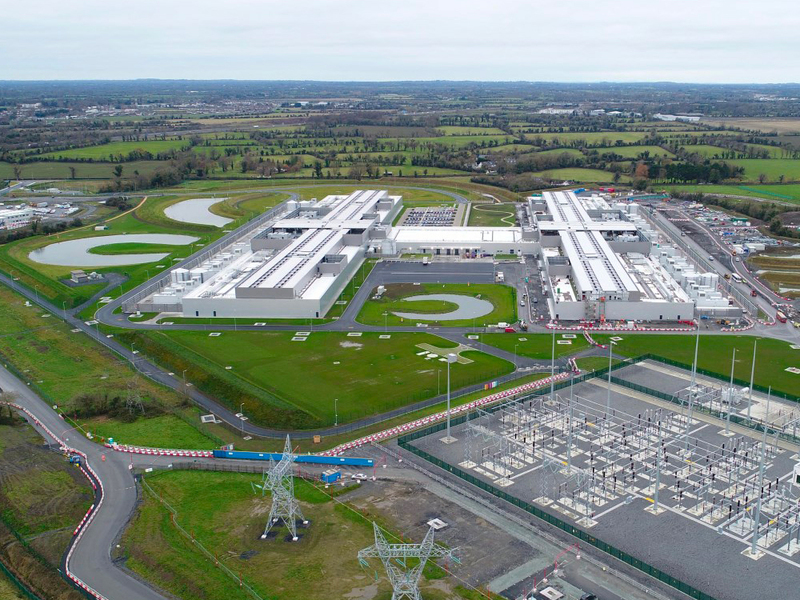 It was constructed on a green field site at the IDA Business and Technology Park in Athlone, and was delivered one week early and ahead of schedule. The brief from the client was to deliver a building that was sensitive to the site and context but also addressing the client requirements for open plan, flexible office interiors. Accommodation was provided primarily in an open plan office space. Cellular offices and meeting rooms were created with acoustic stud partitions with associated glazed screens and folding/demountable wall partitions and all work was finished to a Grade A specification. The process of ground stabilisation, re-using and strengthening of the excavated soil was a significant success and a major factor in achieving the client’s schedule. The overall works on the project achieved a score of 100% in an external quality audit carried out by the NSAI, which reflects its standard of excellence. 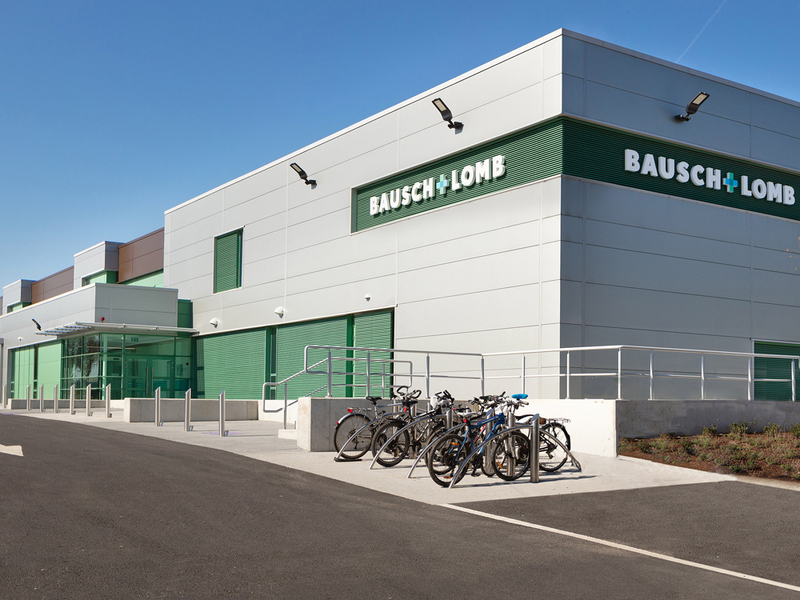 John Paul Construction were appointed to construct two separate projects on the Bausch + Lomb Campus in Waterford. The first project consisted of a new building on the Northern side of the Campus comprising of a two-storey production building with roof level plant area that forms a link to the existing facility. The second project provided the existing front façade with a modern facelift with the construction of a single storey link corridor and a new façade on the overhead recessed first floor. This phase of the project had a huge impact on the existing live production facility and required daily interfacing with the plant. JPC delivered all partial handovers on time and within budget to a standard that exceeded the client’s expectations. Collaboration between Contractors, Designers and Client allied with the good working relationships that evolved throughout the project led to a stellar project result. Category: Industrial over €10 million. This project was divided into four phases; enabling works, a Biopharma manufacturing facility, head office and administration block, research and development laboratory and facility. There was a programme overlap between the different phases and the overall project duration was twenty-two months. At its peak there were 350 construction operatives from 25 contractors working on site, carrying out work on three concurrent phases. The overall budget and final cost for the project was in excess of €50 million. The contractor was audited by the International Standards Organisation in 2015 and 2016 during the project and passed with flying colours. Their Project Quality and Environmental Plan set out stringent processes to ensure that the project was executed correctly, the first time. On this project P.J. Hegarty & Sons UC demonstrated their ability to complete a complex multi-phase project to a high level of safety and quality on programme and within budget. 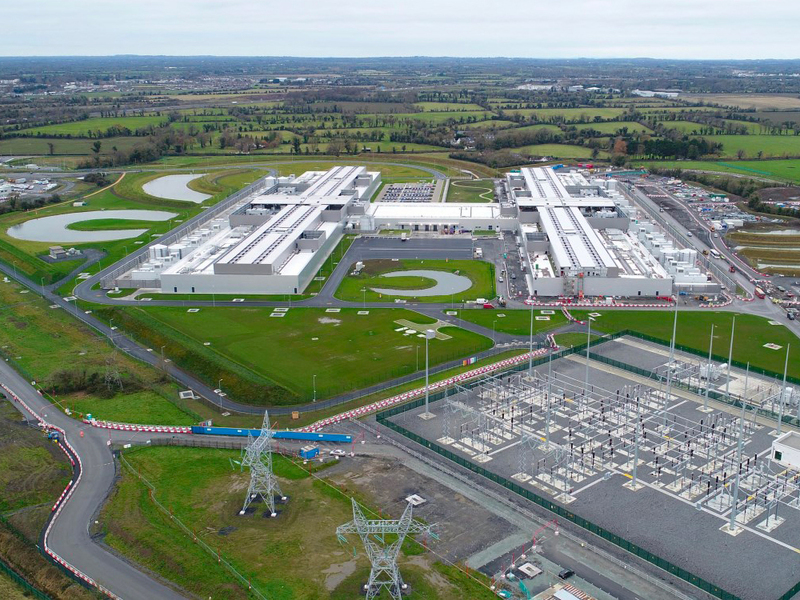 The Clonee Data Centre consists of three single-storey data centres, split into three phases, powered by a purpose built 220kV Substation, on a 95 hectare (Ha) Greenfield site. The site infrastructure includes access roads, car parking, internal roads, entrance security hut and associated landscaping. 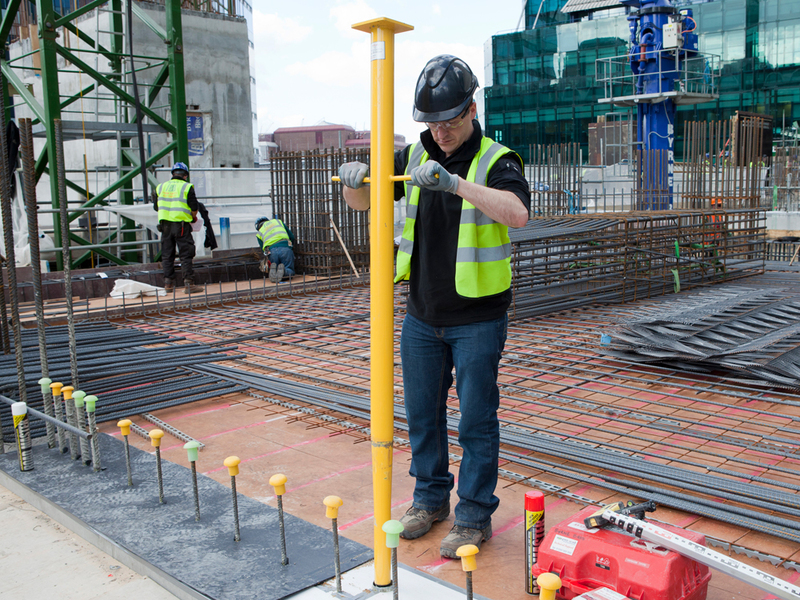 At the project, the Mace team have achieved world-class standards for health, safety & wellbeing, quality and efficiency. 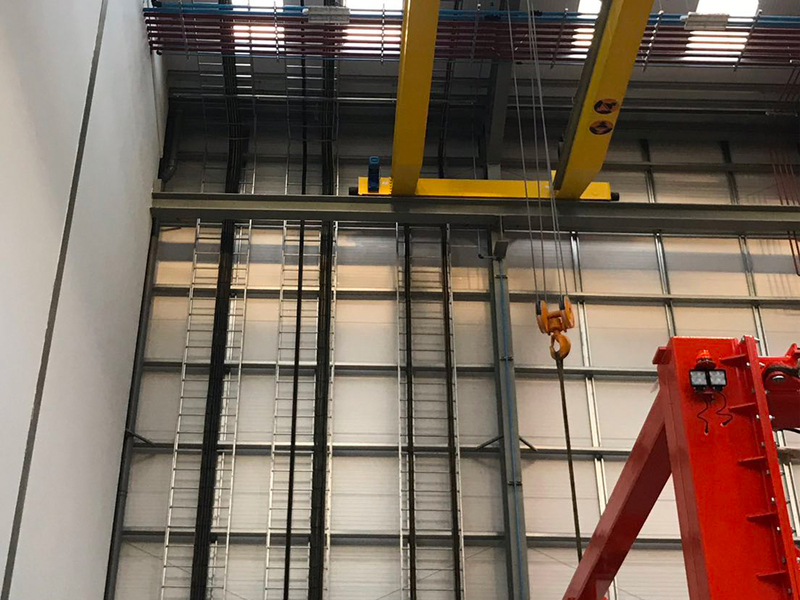 The Clonee Data Centre has achieved 5.1 million man-hours (and counting) on the project, recording one reportable accident, it has become the quality benchmark for the Client’s vast datacentre portfolio and continues to achieve the aggressive programme milestones. The project is also a leading example of the application of Lean Construction and BIM innovation within the construction sector. This project was a refurbishment of a 1990’s building to include the extension and inclusion of a new third floor. The client’s main requirement was to improve the appearance of the building, increase the floor area and upgrade the sustainability of the property. Budget was €3 million and it was completed on time and on budget. Logical decided a lightweight steel structure with steel stairs was appropriate and would reduce the weight imposed on the existing building. A glazed curtain walling system was provided to the third floor to improve the appearance and provide future occupants with a skyline view. A sedum green roof system was installed to improve sustainability. Logical also provided all ‘bolt on’ services: PSDP, PSCP, Fire Safety Cert, DAC and certification. Herbert House is now a modern building with a new building entrance, a sedum green roof system and a striking glazed 3rd floor extension. 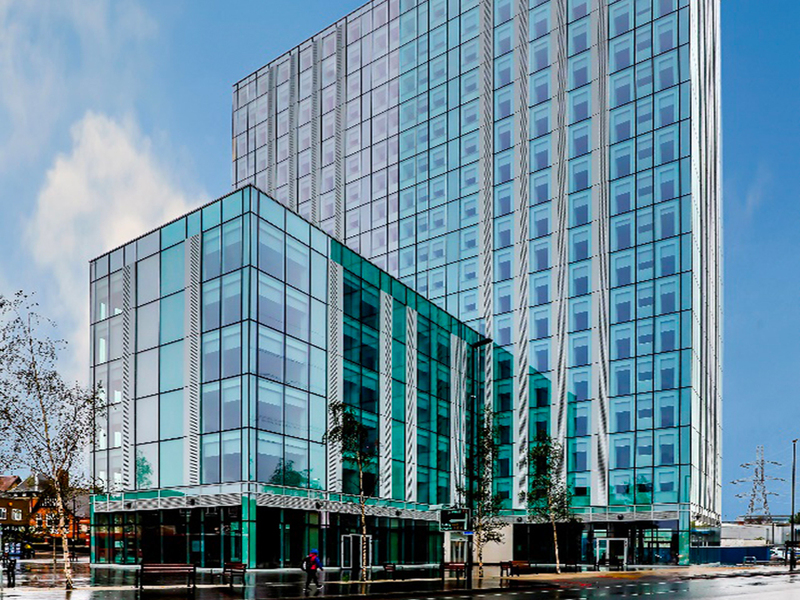 As the Main Contractor Logical were delighted to work with Douglas Wallace architects on this project. John Paul Construction were appointed to construct a new quality control laboratory adjacent to Gilead Sciences existing live facility at their Cork site. The extension is comprised of a steel structure with concrete slabs cast on metal deck, benefiting the client with speed of construction and increased ceiling void space for the services installation, which followed construction. The main distinguishing factor of the project according to John Paul Construction was the collaborative approach between client, design team and contractor, ensuring that the handover was smooth and incident free.The project was a services intense project and the coordination of dense services within the building itself, rooftop and plant room was a critical factor in successfully completing and handing over. The entire project was designed, coordinated, planned and installed using BIM Level 2. BIM coordination of services proved invaluable in early detection and avoidance and also ensured that the building would successfully meet client requirements. 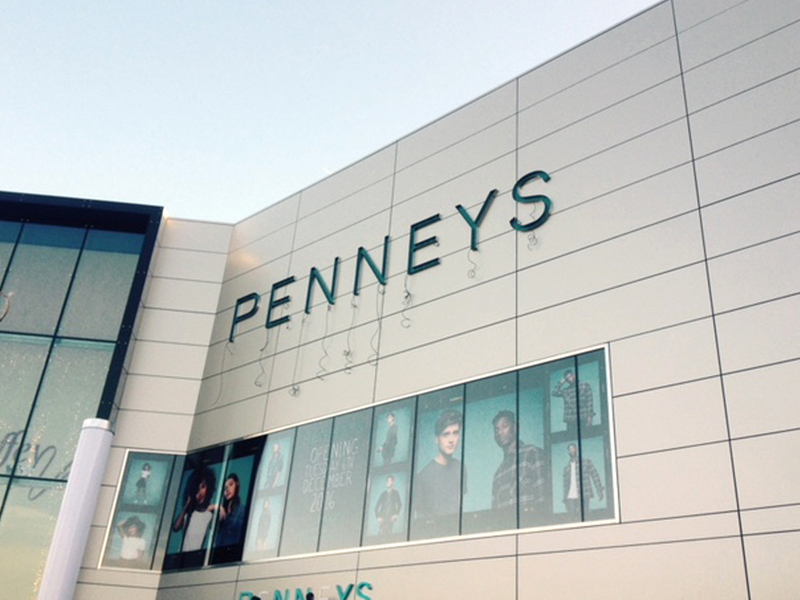 Bennett Construction was the Design and Build contractor on the fit-out of a new store for Penneys in Liffey Valley Shopping Centre. The store is located within the busy shopping centre. The store in total consisted of 60,000 square feet, over three floors. This was split into 45,000 square feet of retail space and 15,000 square feet of stock room and back of house staff facilities. There are two escalators servicing each floor. The escalator atrium is enclosed on the first and second floor with full height glazing. During construction this atrium had to be scaffolded out from ground to roof level to fit the glazing and install the sattler rings at second floor level. As part of the fire cert the atrium had to be fire protected at second floor level with fire shutters that drop on a fire alarm activation. During construction Bennett Construction liaised with the shopping centre management and businesses to inform them of all upcoming works and address any issues or concerns that may have arisen during the very tight programme. Cavan (Waste Water Treatment Plant) D&BO project incorporated a unique technology proposed, designed and delivered by Glan Agua. Mixed Liquor Vacuum Degassing the System is unique to the British Isles and has resulted in a treatment plant exceeding one of the most stringent water treatment standards of any waste water treatment facility in Ireland/UK. The design and build works included operation and maintenance of the existing Treatment Plant, demolition of the existing treatment facility, new anaerobic, aeration, clarification and primary treatment facilities. The plant upgrade also incorporated Sludge Storage, Sludge Dewatering and purpose-built Import Sludge facility incorporating natural Odour Mitigation Technology. The team constructed a new administration and control building, bridge crossing and new access roadway. 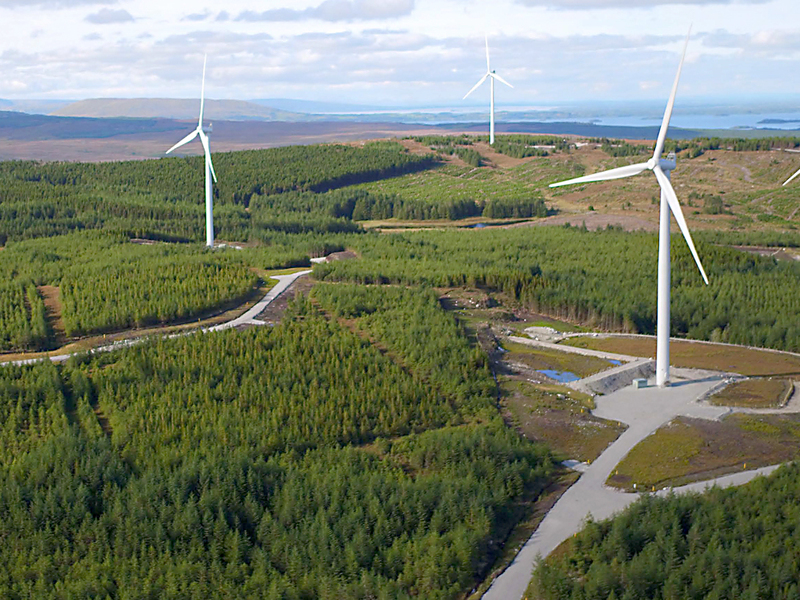 One of the factors that led to this project being completed successfully and on time, was through the collaborative relationship built up between Roadbridge and the SSE Renewables personnel on the project. 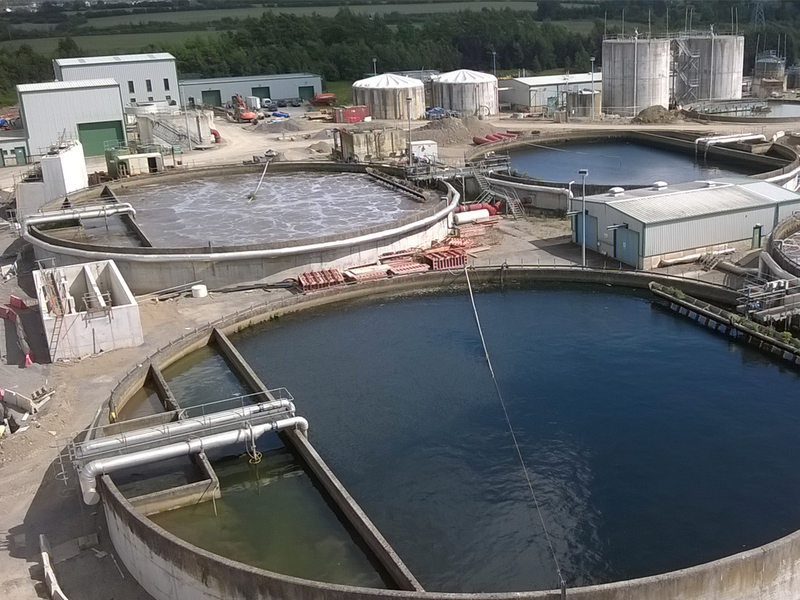 Irish Water has invested in a major upgrade of one of the country’s largest wastewater treatment plants at Osberstown, County Kildare. The existing infrastructure was under pressure and unable to support future economic and social development in the region. The upgrade involved the expansion from an existing capacity of 80,000 Population Equivalent (PE) to 130,000PE. 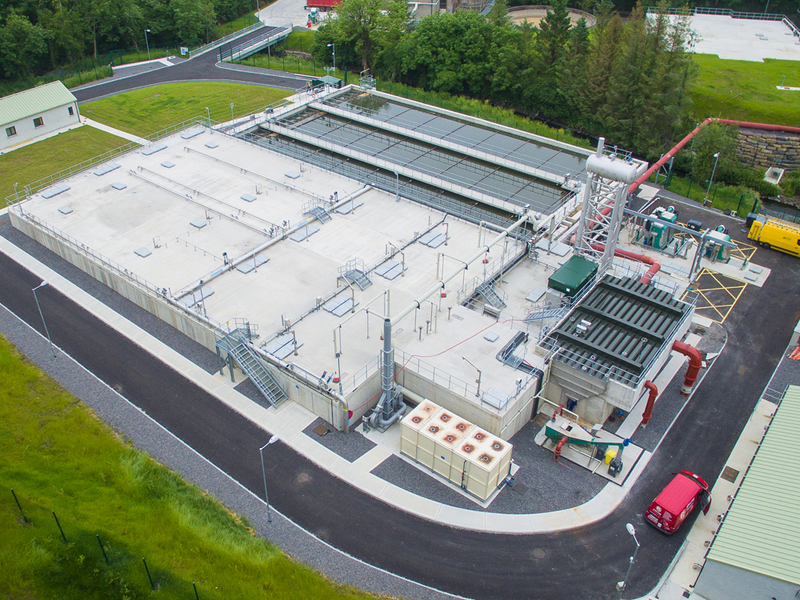 The main contractor Veolia Ireland / BAM Contractors successfully delivered the project whilst operating and protecting the existing treatment plant. The fact that no critical infrastructure was affected throughout the works is affirmation of the effective planning and integration of this design-build project. Construction works for Luas Cross City were carried out by a joint venture between John Sisk & Son (Holdings) Ltd, Ireland’s No1 provider of construction services with extensive operations across Ireland, the United Kingdom and mainland Europe, and Steconfer, a global railway construction company based in Portugal. The main infrastructure works project for Luas Cross City project started in February 2015 with enabling works commencing in June 2013 and has delivered 5.9km of track with 13 new Luas stops taking Luas through the city centre and north to Broombridge. The project was scheduled to run over a 32-month time period; this included all design, construction and commissioning activities to allow for passenger service. The project was delivered within this schedule. Over half the project was constructed in a live city environment whilst maintaining traffic and pedestrian corridors throughout. This was achieved through considered planning and extensive engagement with local authorities, local business and transport providers. 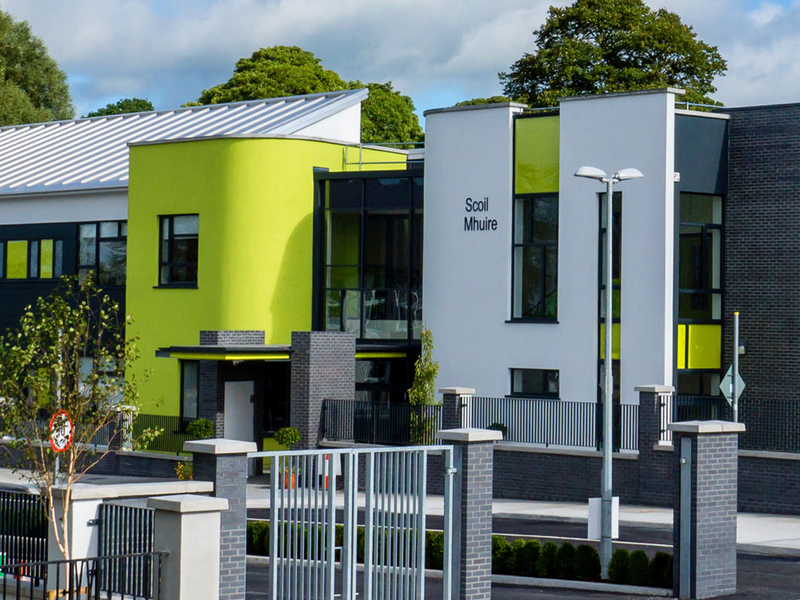 This school project involved the upgrade of the existing Scoil Mhuire, built in 1957. A large new extension was added and the existing school was refurbished. Site works included the construction of a vehicular access and drop-off within the school grounds to alleviate the traffic chaos that existed on the main road fronting the existing school. The tender sum was €4.35 million The client requirements were for a school that met the needs of the increasing school population without the need for prefabricated structures. The design by McOH Architects was novel and sympathetic to the retention of the 1957 building while providing a modern school extension. The school also needed to continue to operate during the construction phase. Carroll O’Keeffe say that their previous experience in constructing in live school situations was of great benefit. The civil engineering expertise, provided by their joint venture partners Killeen Civil Engineering was used in dealing with large rock excavations with large volumes of water ingress. The rock and demolition waste were crushed on site to provide approved fill on site. The completed scheme has been universally well received from a Planning perspective, Educational perspective and Community Perspective. 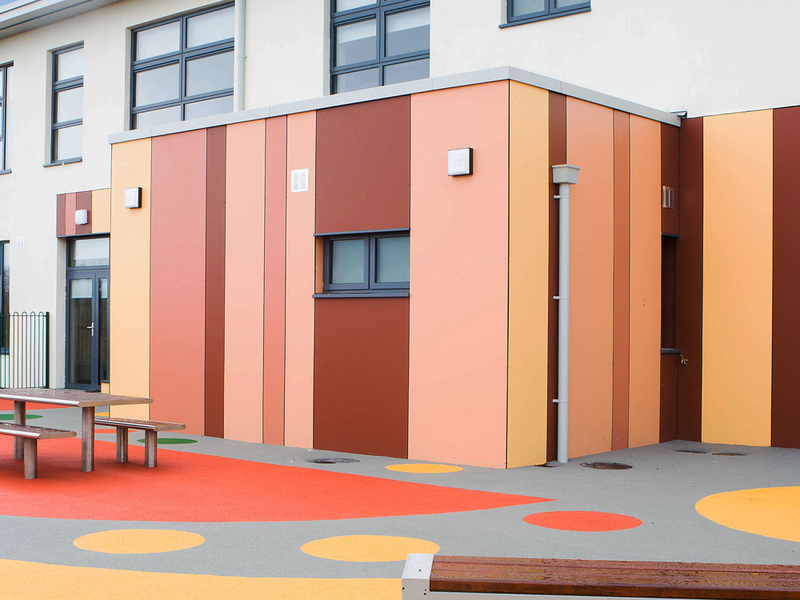 This project involved the construction of two schools circa 3,000m2 each and associated site works at a Greenfield site at New Ross, County Wexford for New Ross Junior & Senior Schools. The schools consisted of eighteen classrooms incl. home school liaison rooms. There are two fully spec’d class room special needs units within each school catering for students with varying levels of special needs. The school buildings at New Ross far exceed all energy and performance criteria. They are A rated with an exceptionally high level of air tightness. A Mac Wall System was used to replace existing and retaining walls to substantially reduce the schools carbon footprint. By utilising a non-concrete wall system and reusing rock from the earlier excavation of the site, they were able to provide an economical and environmentally sound solution to the schools needs. 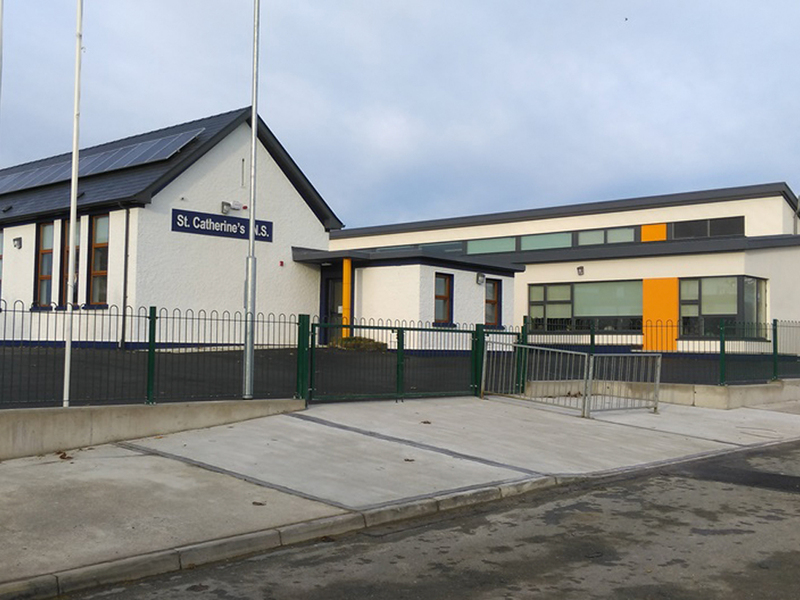 The works comprises the low energy retrofit of the existing 3-classroom school (228.5m2) (including a new heating system and removal of existing electric storage heaters and fabric upgrade) and the construction of a single storey 4-classroom extension and glazed link, to nZEB standards (Nearly Zero Energy Buildings), to the existing school (423m2). The extension includes 4 classrooms, shared space, and other ancillary accommodation. The works also include the removal and demolition of the existing prefabs and shelter. The site works comprises new external link to the new extension, new ball court, reinstatement and making good of the foul drainage system, storm water drainage system, and existing hard landscaping including the resurfacing & re-grading of concrete yard to facilitate level access from car park with new ramp to main entrance, and new line markings to existing staff parking. 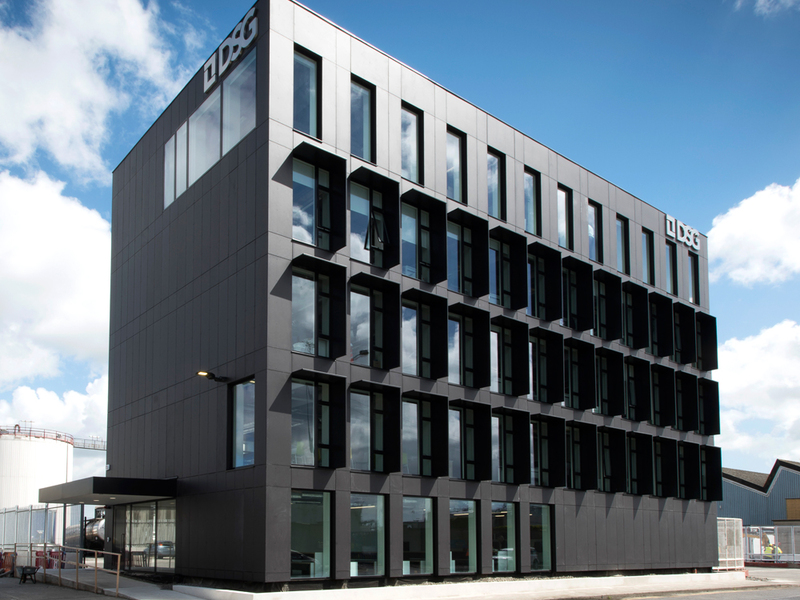 The project is a prototype nZEB building for the Department of Education & Skills, and completing it to the required standards was a major success of the programme. 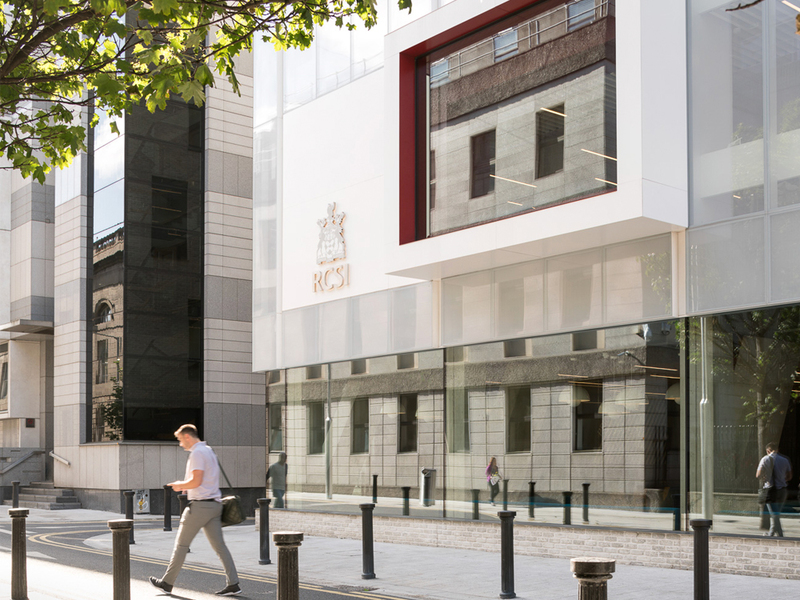 Educational facilities for Royal College of Surgeons Ireland | Bennett Construction Ltd.
Bennett Construction Ltd were the Assigned Builder and PSCS on the RCSI New Academic and Education Building, which is the largest redevelopment project in Dublin’s city centre in recent years. The building was constructed upon the site of a previously uncompleted scheme, which contained a basement box element only, which was in turn incorporated into the new development. Demolitions and alterations, temporary works, piling, excavation and earthworks were all required in advance of the construction phase. 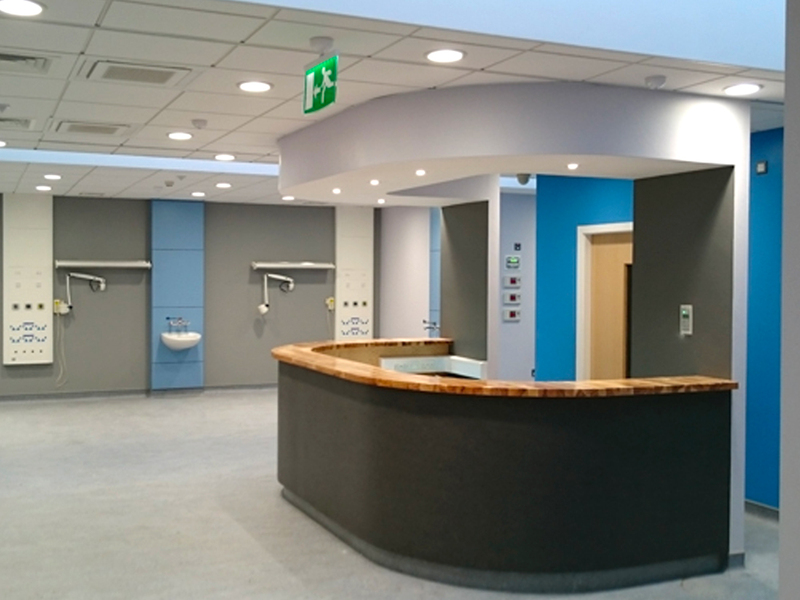 This project demanded a highly complex programme of spaces including technically advanced simulated environments for clinical and surgical training as well as facilities for students and staff. The interlinked vertical stacking of such varied functions meant an increased complexity of structure and services due to the nature of the highly compact urban site. Ultimately, BCL provided a turnkey medical training facility to the highest specification, management and coordination of over 300 workers on site during the peak of this project. 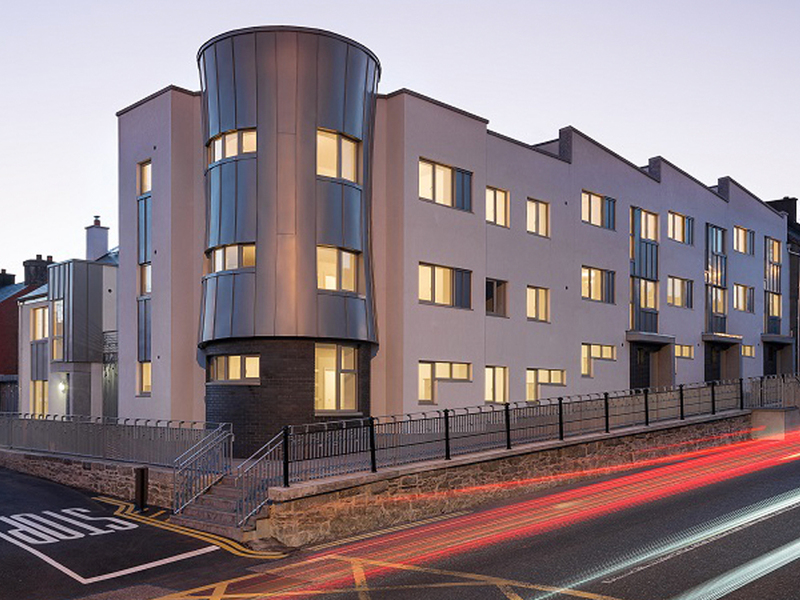 This 1,200 m2 project involved the construction of 26 additional bedrooms on top of an existing facility at second floor level above a fully occupied nursing home in Blackrock. The project involved an extension to the west wing of the existing three-storey nursing home in the form of infill extensions at ground and first floor levels and a vertical extension over the existing west wing to provide a second floor level accommodation. The design of the day and bedrooms were carried out using BIM and 3D virtual reality software to model and develop the design for the client. This allowed the client to quickly visualise concepts and give direct design feedback. In order to maintain a comfortable living environment during the works, prefabricated components were used where possible to minimise noise and visual obstruction for the live-in residents. Considering all the factors that affected site logistics was crucial, and a logistics manager was appointed throughout the programme. 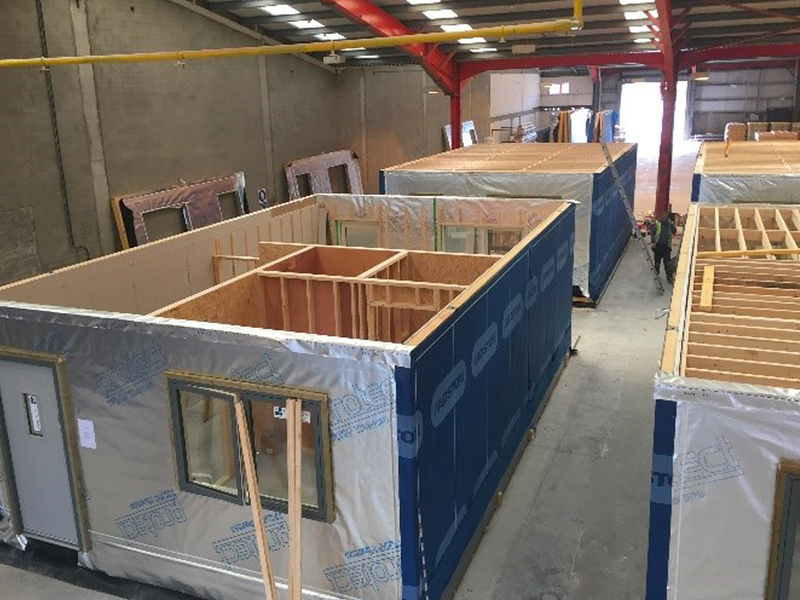 The brief required Broomfield Construction Ltd to demolish and remove an existing prefabricated Accident and Emergency Unit at Our Lady’s Hospital, Navan and replace with a prefabricated Accident and Emergency facility and associated siteworks. The Accident and Emergency Unit that was delivered was a far superior building than the original proposed modular building. The large waiting room area gives patients a sense of relaxation with the soft colour scheme and a good ventilated space. Broomfield Construction worked closely with the design team and client from start to finish making sure that they got all the facilities which they required in order to carry out their practice, despite all the challenges that arose pre-contract and throughout the project. Communication between the contract team and the overall project team was essential and a great success in getting the project in on time, in budget and to a high quality. 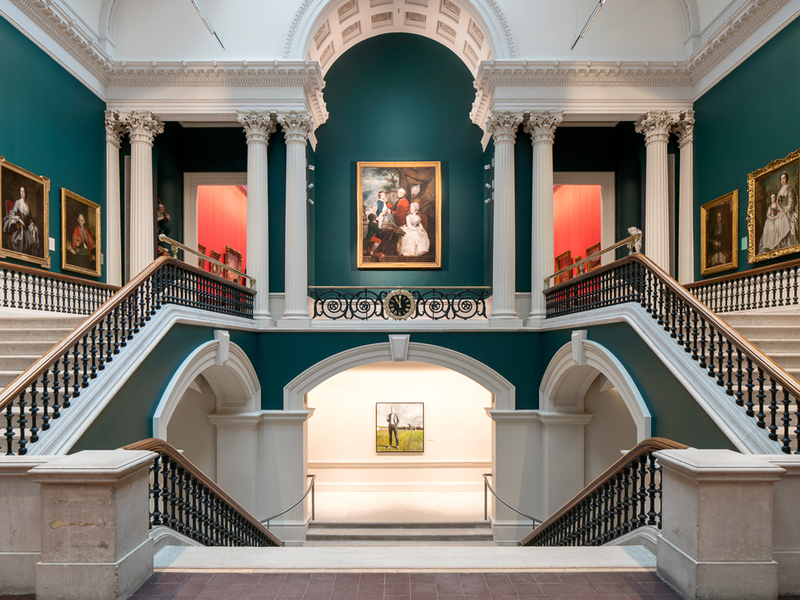 The National Gallery of Ireland was re-opened in June 2017. The project involved the restoration and refurbishment of the Historic Dargan wing (1864) and Milltown wing (1904) which house the country’s art collection and included the reconfiguration and restoration of the previously hidden Sculpture Court area that centrally divided the two historic wings. The end product and finished restorations have well exceeded the restoration brief, exemplifying excellence. There has been very positive comments and feedback from not only the Client and end user, but also through the television documentary, the newspapers and more importantly the general public with the huge increase in the footfall since opening. In preparation for the commemoration of the centenary of the Easter 1916 Rising An Post appointed P.J. Hegarty & Sons to carry out façade restoration works on the North Elevation of the existing East courtyard of the GPO with the view of restoring it to its former glory. As these works progressed and the evidence of the restoration showing spectacular results, PJH were instructed to proceed with restoring the East, West and South elevations also. 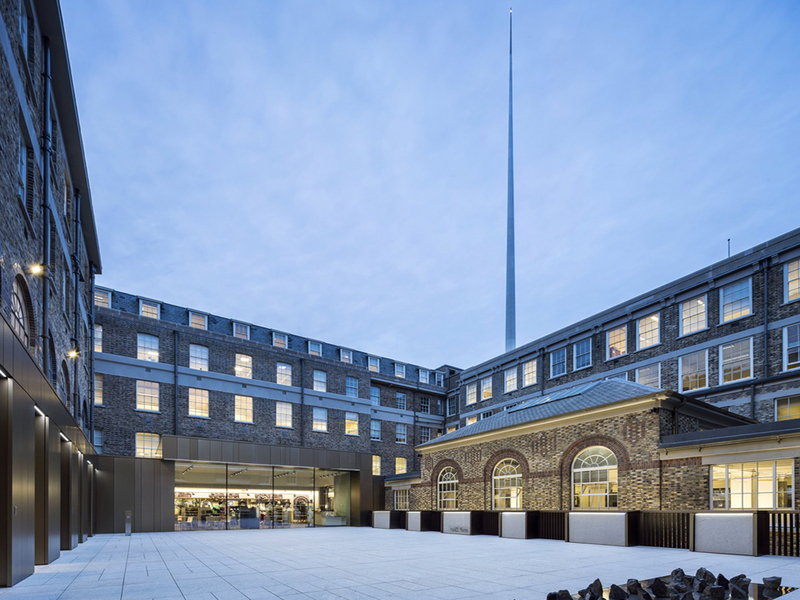 Following on from the successful completion of the façade works, they were successful in tendering for and winning the contract for the construction of the new Exhibition Centre (Witness History) in the East courtyard. P.J. Hegarty & Sons delivered the project with the final account being agreed at an amount significantly less that the contract sum, thereby providing excellent value to An Post. St Mary’s Church has been converted into Kilkenny’s Medieval Mile Museum. The project combined sensitive restoration and contemporary design to an exemplary standard. 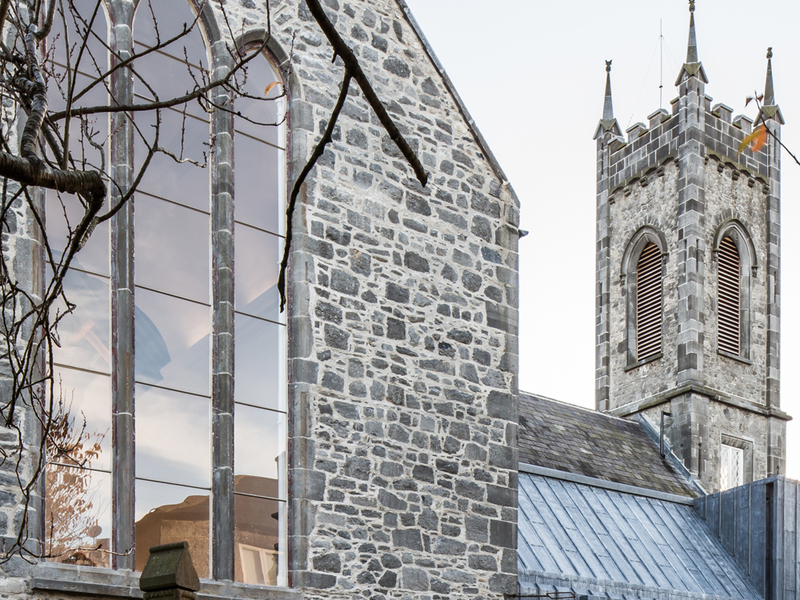 The restoration, extension and conservation of St Marys Hall forms part of the larger ‘St Marys Precinct’ project and the completed building is now the centre-piece of Ireland’s Medieval Mile, a concentration of medieval sites and buildings in the core of Kilkenny City. The feedback from Kilkenny County Council has been very positive. The building has been successful in attracting a large number of visitors to the City and has been the focus of a significant number of professional and academic studies and presentations. 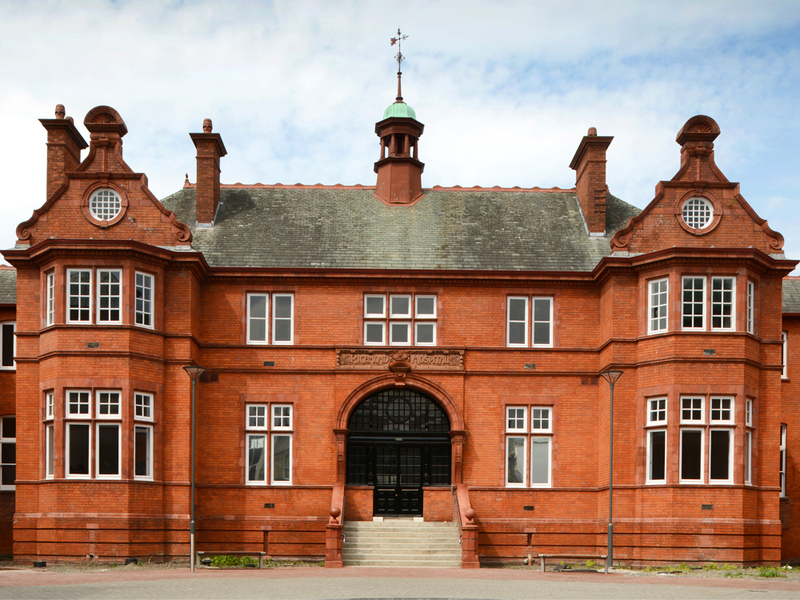 This Townlink Construction project involved the complete refurbishment of the former Richmond Hospital building to form a new teaching, training and event hosting facility. The building is a protected structure, constructed in the 1890s, that has accommodated a hospital and a courts service. Townlink had to ensure that all works undertaken within the building were carried out with due care and attention to the historic nature of the building. The project cost was €3.1 million. Client requirements to complete on time and on budget were achieved. The key stakeholders are impressed by the standard of workmanship. The Client expectations around the quality and standard of restoration work were met and exceeded with regard to the number of original features that were uncovered and incorporated into the finished restoration. 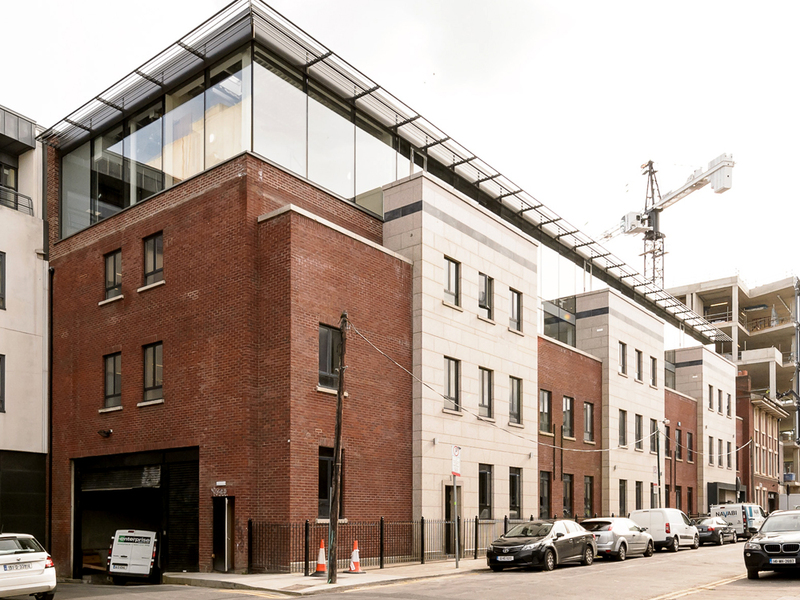 Kennedy Wilson purchased the existing office building at No’s 27 to 33 Baggot Street, Dublin 4 to refurbish as a new office block for a multinational tenant. The existing building comprised 3 blocks, Block A opening onto Fleming Place, Block C opening onto Baggot Street and Block B joining the two (11,500m2). The new building is 17,500m2. The high-spec office facility project was delivered by John Sisk & Son (Holdings) Ltd incident and accident-free on a very restricted site. Both Kennedy Wilson and the tenant, Bank of Ireland, were exceptionally happy with the quality delivered within the extremely tight timeframe and importantly on budget. 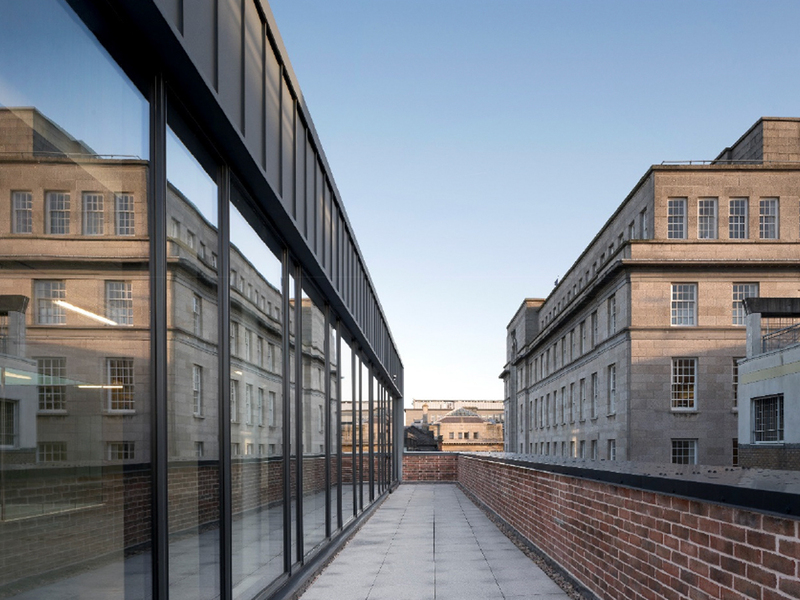 1 George’s Quay – Irish Life wanted to bring to life the reincarnation of 1GQ by developing a ‘best in class’ office building which is held as a long-term investment. mac were chosen to deliver this vision. 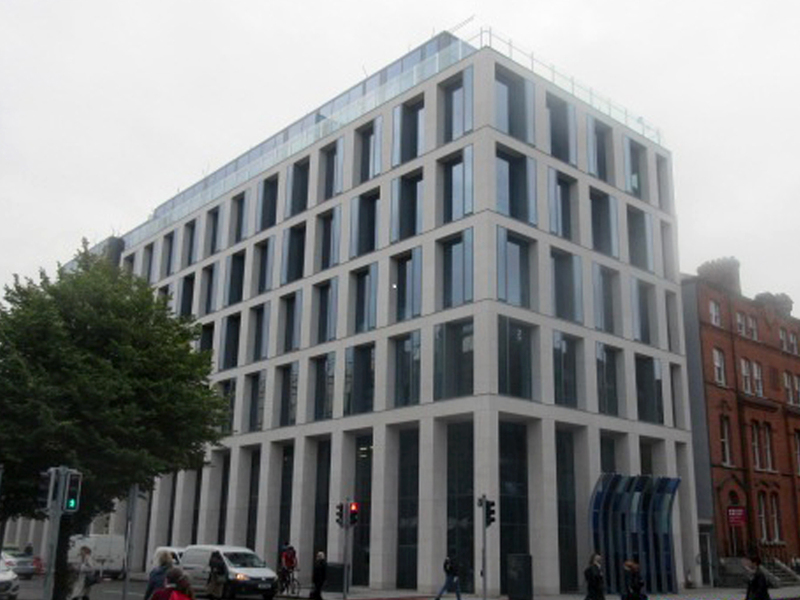 The project was a €23 million full building refurbishment 141,000 sq ft over 6 floors and a CAT A landlord fit out. The project came in on budget and got building BCAR certified quickly. The building has achieved an A-rated BER and a LEED Platinum certification. This project marked a milestone in mac’s evolution into the construction industry. 40 Molesworth Street comprises of approximately 30,000 sq ft of highly specified Grade A office space offering flexible, tenant friendly floor plates and the highest modern design standards to provide the ultimate occupier experience in a superb business location. The Client is extremely pleased with the final outcome of the project, so much so that the building was handed over to the new tenant the same day as Practical Completion was awarded. P.J. Hegarty & Sons UC pride themselves with the fact that the company ethos is to provide high quality products for their clients. 40 Molesworth Street was no exception. Great time and effort was devoted to producing samples and mock ups to ensure that the finished product fully met the Client’s expectations. The scope for the refurbishment and conservation of existing buildings at 30-32 Molesworth Street and the demolition of all buildings to the rear included a reduced level dig to 1 basement level prior to construction of new 4-storey over basement office accommodation. The buildings floor area is 3,744m². Collen Construction excelled in the delivery of the project on site through collaboration from an early stage with the design team. The project has been accredited with LEED Gold standard, one of the first office buildings to do so in Ireland. The project is one of a small group of innovative buildings demonstrating the commitment to sustainability in Ireland. Kilcawley Construction managed the adaptive re-use of the former Burmah Castrol Building, an existing concrete frame 5 storey office building for Doyle Shipping Group (DSG). This building of 1,214m2 in Dublin Port dates from the early 1970s. It is one of the tallest buildings in its industrial surroundings, and a landmark in the Port. Originally a 3 storey-building, with 2 additional floors added later. The new façade design has given the client an increased identity within Dublin Port, and one which is fully integrated within the completed building design. It also provides higher thermal performance and building comfort than anticipated. The project was delivered on time and to budget to a quality which goes beyond what the client had hoped for. It is now fully operational and a hive of activity from where the Doyle Shipping Group drive its continued growth and expansion. Airbnb Warehouse Building | Bennett Construction Ltd. 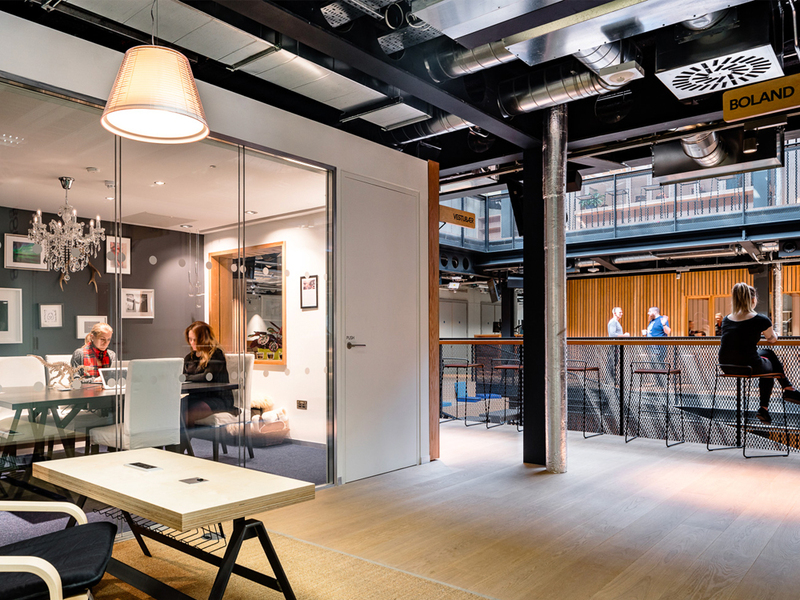 The Airbnb HQ project involved both the redevelopment of No 6-8 Hanover Quay (a 19th-century warehouse building) and a fast track fit out. The fit out ran concurrently with the shell and core works. The redevelopment works included the removal of internal walls and structures providing an open plan office layout across 3 floors (2 storeys over lower ground floor with central atrium). Also included was the retention, repair and restoration of external facades and re-opening / extension of windows and other opes. 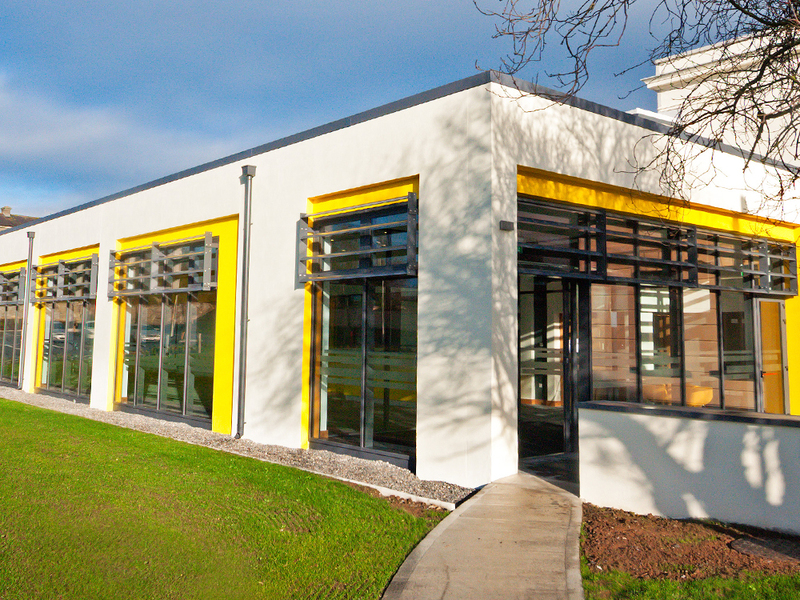 The Thurles Municipal Library project involved refurbishment and upgrade of the existing library HQ, which is a 200-year-old protected structure, as well as the construction of a new extension to the rear of the property. The building now provides a home for the District Council Chamber, a public reception and exhibition space, hi-tech meeting rooms and offices, including a book depository and support offices for the library services. Conack has a proven track record in delivering prestigious fit outs. Conack Construction took the lead from the Client which ensured the fit out was above and beyond the Client’s expectations. Conack have developed the necessary resources and management systems which enabled them to successfully deliver this project that was designed, constructed and commissioned to the highest quality standards and delivered 4 months earlier than scheduled and within budget. 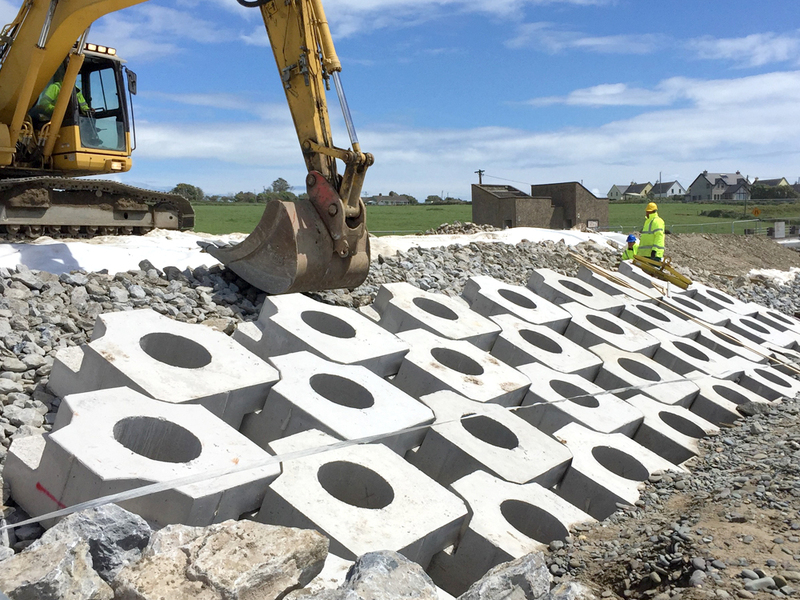 The main element of works on this Regan Construction project was the construction of a revetment for approximately 60m west of the existing concrete retaining wall along Garretstown Beach. Also included in the scope of works was the construction of new public access steps to the beach. The tender value for these works was €113,000 with the final cost of the project being €127,000 including for 2 additional items requested by the Client during the project. As such the Client received the original project within budget and within programme. The use of the ECAB coast protection system is an innovative, sustainable and cost-effective solution to coastal erosion and demonstrates great innovation. 15km north of Bantry, the Borlin Valley Embankment is a 120m long, 25m high bank with the L – 47245 (cul-de-sac) running along its toe. The Coomhola River is immediately to the east of the road. An initial slip failure of the embankment occurred in December 2015 – blocking the road for 12 days. The objective was to stabilise the embankment so that the road is no longer at risk. 6 options were included in the preliminary report ranging from €170,775 to €753,500. Pat O’Driscoll Civil Engineering Ltd were the successful tenderers in August 2016 at €197,002. The objective of stabilising the embankment was achieved, despite the difficult ground conditions and weather. 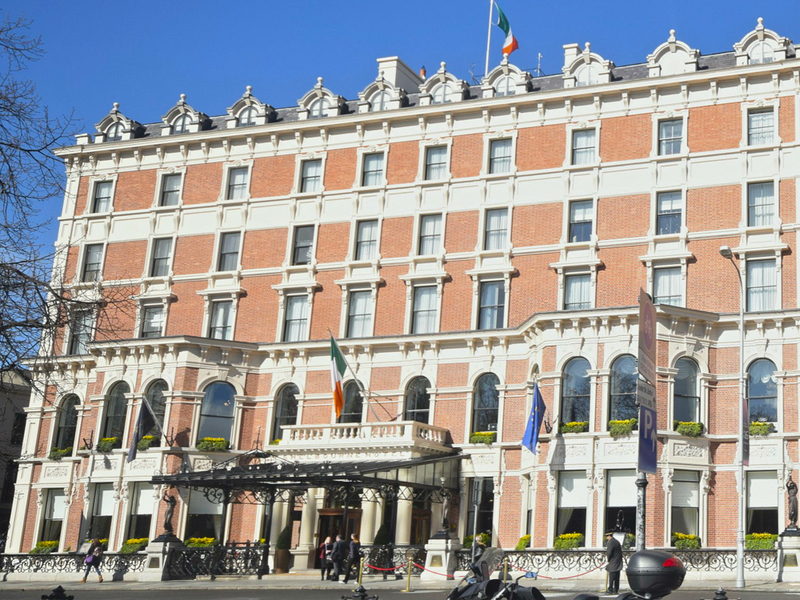 In 2012, Acol Limited was commissioned by Client Kennedy Wilson to carry out protective works on the Shelbourne Hotel façade, which was crumbling and in urgent need of intervention, following a bitterly cold winter of 2011. The restoration was one of the largest restoration projects to take place in Ireland in recent years. The scale of the works and the fact that they were carried out by hand by artisan craftspeople specialising in brick repair and wigging, timber window restoration and moulding using Roman cement makes this an impressive project. Over 130 traditional craftspeople worked on site across the duration of the project. The restoration was awarded Irish Georgian Society Architectural Conservation Award 2017 because of the scale and intricacy of the work that was carried out. This Combilift production facility is now Ireland’s largest single manufacturing plant under one roof, measuring 46,000 m2 on a 40-hectare site. 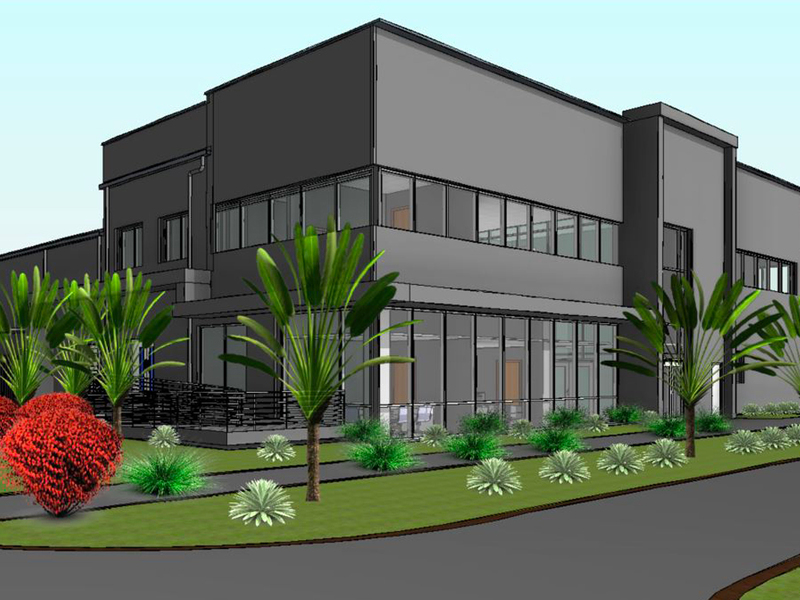 It is Combilift’s new global HQ and production facility and includes a dedicated Research & Development building and administration offices. King & Moffatt’s scope of works on the project consisted of the full electrical services installation. Collaboration with the Client and main contractor was an enormous success on this project. The major obvious successes of the Combilift project were that it was completed on time, within budget and to the Client’s satisfaction – key ingredients to a successful project. 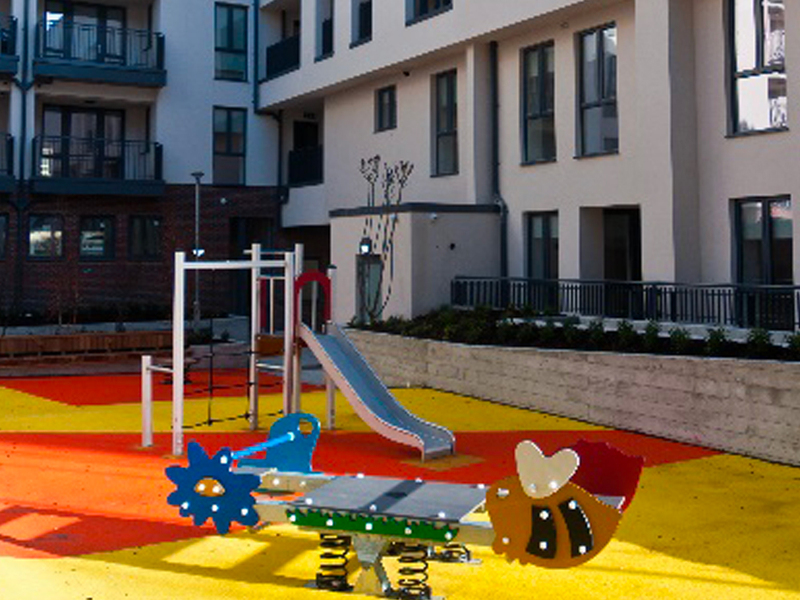 This project was constructed for Cork County Council under the Rebuilding Ireland programme. The client’s brief for the project included the requirement for 10 housing units, complete with associated site development and infrastructural works in accordance with the National Guidelines for Quality Housing for Sustainable Communities. The project duration was not to exceed 12 months. The housing mix was to comprise 3 two-bed duplex town houses, 3 two-bed apartments, 3 one-bed apartments and 1 three-bed detached house. The Tur Liath development consisted of ten dwellings over three floors to be constructed on a brown field site. All site activities and traffic management plans had to work in harmony with the operating environment and local authorities requirements. The restrictions around the site meant that there was no room for errors in the pre-construction planning activities. MMD Construction took a positive approach in using this project as a method of refreshing the company’s skill set once again for residential projects. The client and developer on this project was O’Malley Construction Company. The requirement involved securing a viable Planning Decision on the 5-acre site and Designing a suitable mix of High End Houses and Apartments, suitable for the market and setting of this unique location. A 2.5 to 3 year programme was required to complete the entire project. Phase 1, which involved the Construction and Handover of 21 houses was successfully completed within the first 2 years. The team utilised digital tools throughout the programme. The use of laptops, portable devices, cloud services, scanning, photographic records and digital record keeping were utilised throughout all stages of works. Full broadband services were used for the main form of communications through email, cloud server collaboration and record keeping. Throughout the project the build programme and budget control were fully adhered to. The Building Energy Designs, Calculations and Specifications required ongoing adjustment and calculation. Securing and negotiating with suitable Contractors was necessary in the procurement phase. Rahillion has one hundred 3, 4 and 5 bedroom houses overall. They are mostly semi-detached houses with an additional mix of detached and terraced houses. 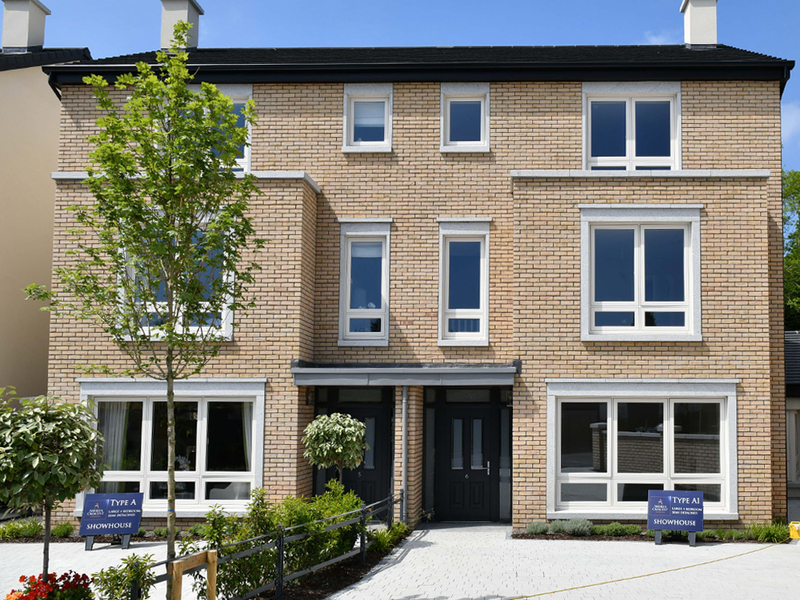 The development is in the rural town of Donabate, Co. Dublin. Ballisk Homes are the client and the builder. The houses were substantially redesigned to make the most of the size and layout of the houses whilst creating a greater aesthetic appeal. The houses were built using a new concept of modular steel frame construction. Construction timing is very different to normal construction as the pace can be very fast. Ballisk Homes learned that adapting quickly to fast schedules was key to the success of this programme. The length of time for construction of a house is reduced to 6 weeks on site. The end product is very desirable and all units in the following phase have been sold. Hansfield Wood, which forms part of the Hansfield Strategic Development Zone (SDZ), is a new socially integrated community comprising 466 new homes. The SDZ as a whole will comprise 3,000 new homes together with shops, two large schools, 5-acre public park and all associated services located in Dublin 15. Alanna Homes will be responsible for the delivery of approx. 1,100 new homes and the associated infrastructure within the SDZ, including Hansfield Wood (Phase 1). Over 300 houses and apartments have been delivered since construction commenced on site in May 2016. Alanna is also responsible for the delivery of a 5-acre public park, which is currently under construction which will form the epicentre of the Hansfield Wood Community. Forming Strategic Alliances with a number of key contractors allowed for the build process to be streamlined and more efficient, with that, building these key relationships ensured that budgets were achieved and work completed in line with the build programme. 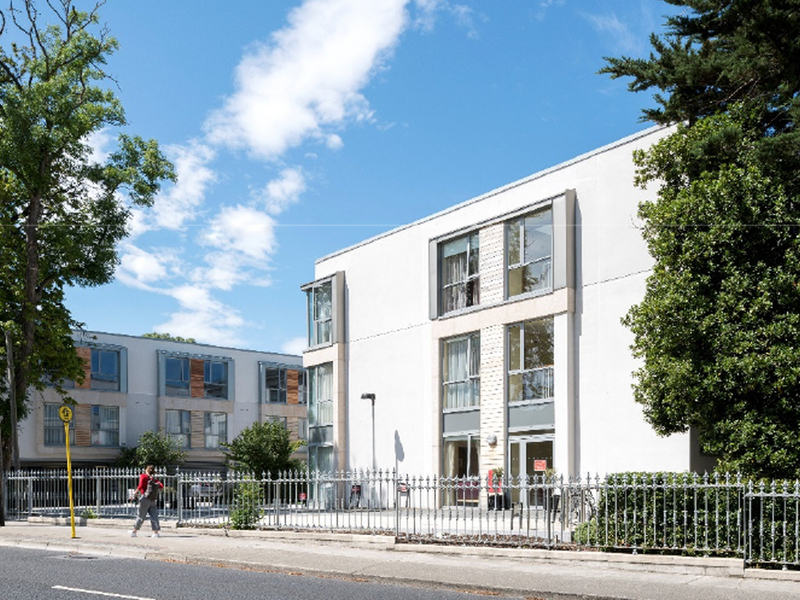 Charlemont Regeneration Project – Block 3, Ffrench-Mullen House is a residential development of 79 high-quality social housing units and a range of community amenities in Dublin City Centre. 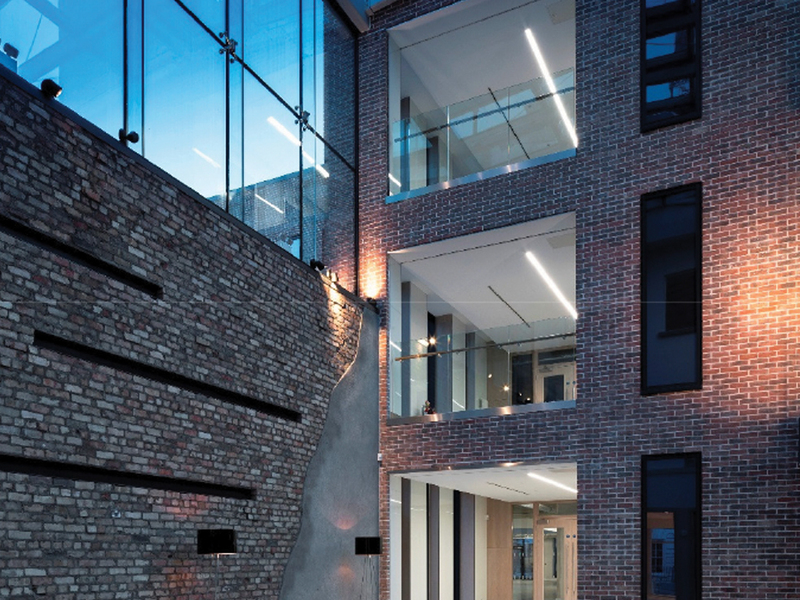 The building is in a prominent location on Charlemont Street, Dublin 2 and was completed in October 2017 for Dublin City Council under a partnership agreement between McGarrell Reilly and the Council. 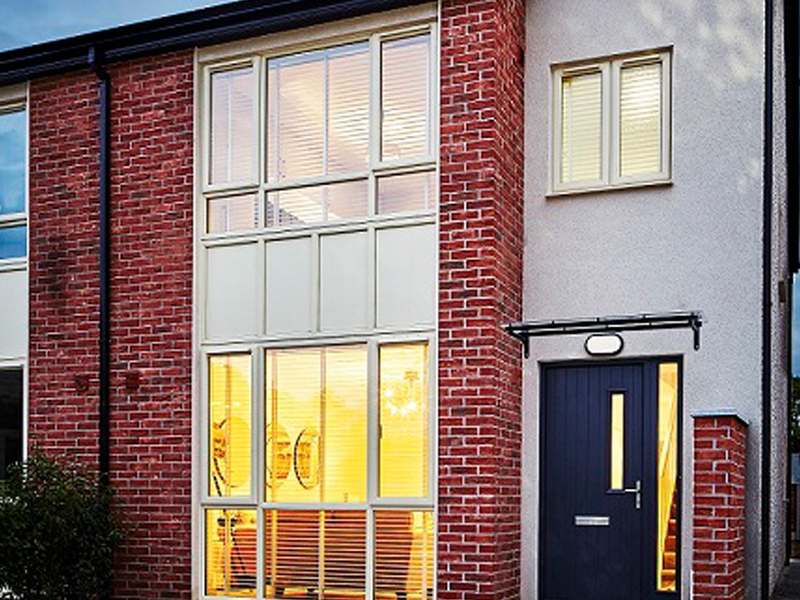 JJ Rhatigan & Company as the main contractor completed this to an exceptionally high standard. The project has been delivered ahead of programme and provides a mix of one, two, three and four bedroom homes for Council tenants, including six ground floor, own door duplex homes. The feedback from both the Client and the residential occupants has been very positive. The Client has noted its appreciation with the way in which the contract was managed on site and the smooth proactive nature of all the team involved. Built to the highest standards and designed without compromise, the 59 houses at Silken Park offer some of the finest quality homes on the market today. 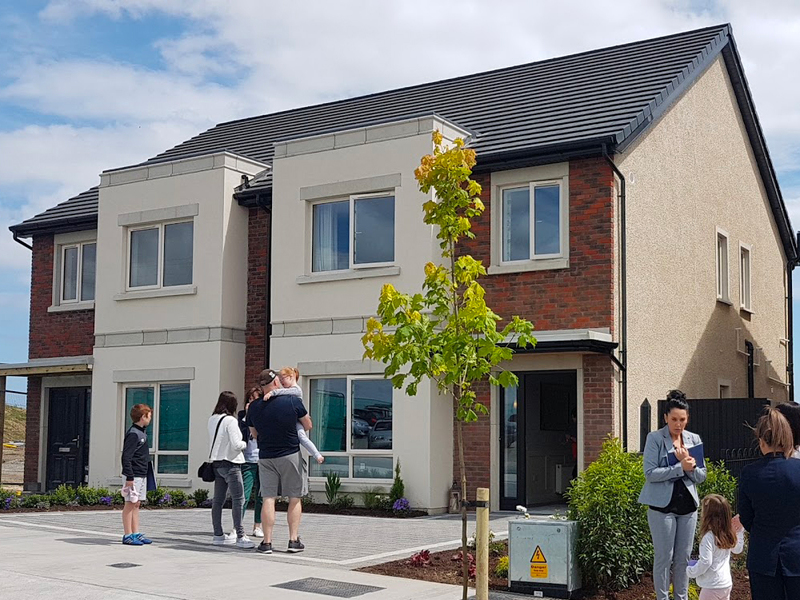 Built to a passive house specification, at no extra cost, due to Durkan’s in-house detailing and use of single leaf blockwork with external wall insulation, the result is extremely cost effective. The houses are NZEB ready for the incoming regulations in 2020. The Passive House Planning Package allows Durkan Residential to value engineer their buildings before they start, meaning effectively ‘less in, more out’. Using Kore insulated slab meant a more efficient use of excavation and almost zero waste in concrete and insulation. Throughout the project, subcontractors and suppliers were educated on the Passive House message. 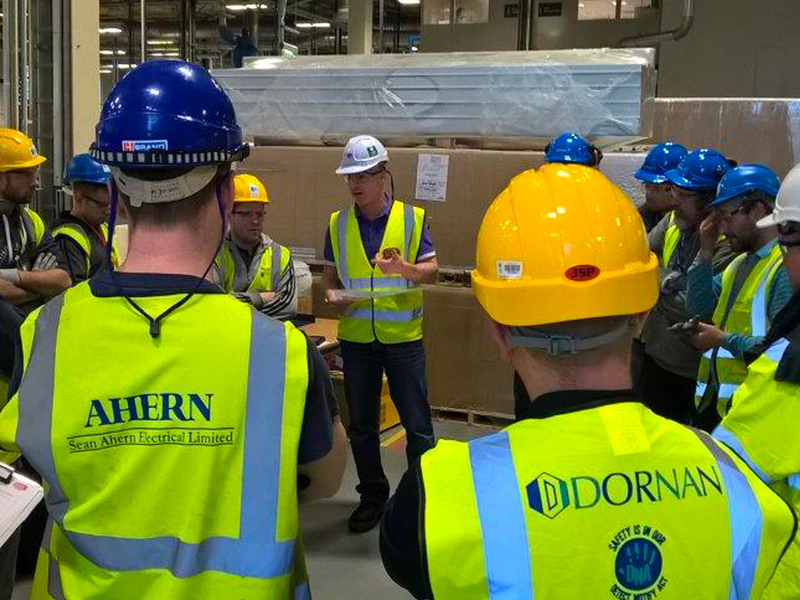 Passive Tool Box Talks were devised and delivered to each subcontractor, as each team member has a major role in achieving thermal bridge free and high levels of air tightness construction. Páirc Uí Chaoimh is a long-established sports ground but by 2013 it was clear that it required extensive redevelopment. The regeneration of the stadium has resulted in a multipurpose floodlit bowl-shaped arena that can accommodate a capacity of 45,300 for games (47,000 for concerts) including 21,300 seats under cover. It also includes a second all-weather playing pitch and landscaped spaces to cater for different activities on match and non-match days to enhance the viability of the project. 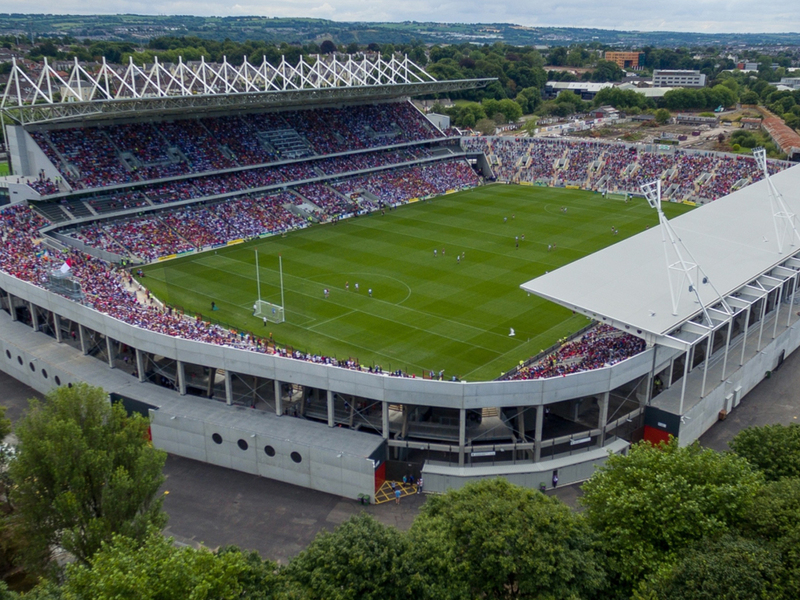 Páirc Uí Chaoimh is now an impressive modern facility situated on the banks of the river Lee, it has already made a very positive impact, providing a wonderful player and spectator experience. 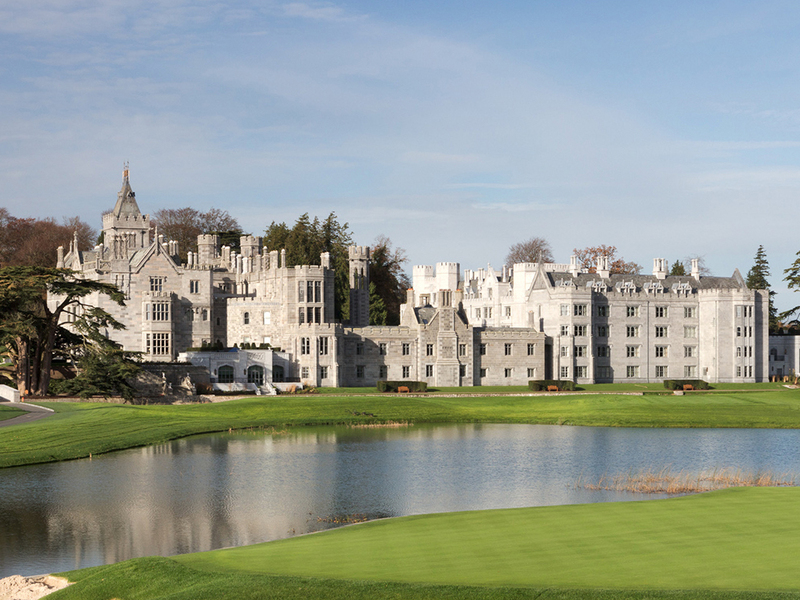 Adare Manor is a major project undertaken in a constrained timeframe, recreating a luxury 5-star hotel and golf resort on an 840-acre estate in Limerick. Client requirements were to create an unrivalled experience for guests; to open on time with no defects working collaboratively with the design team and contractor; achieve this project on budget to the highest of standards and maintain the old charm of the Manor. The quality of the completed finishes from all aspects is world-class and the design concept, with a mix of the old and the modern, does not take from the original aesthetics of the original Manor. This project demonstrates construction excellence in that the Client’s expectations were surpassed – and the project was handed over on time and within budget. 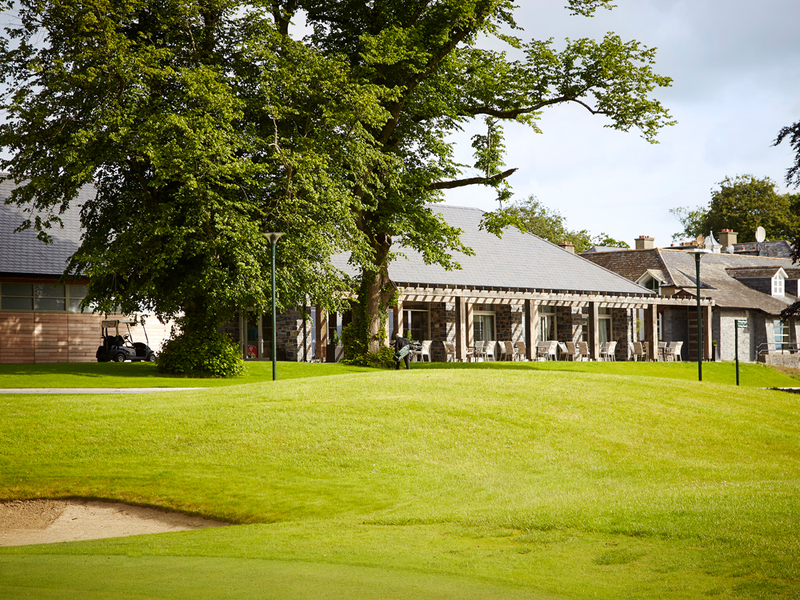 MCA Architects undertook to design and manage the building of Mount Juliet’s new Golf Club facility on behalf of the Client Tetrarch Capital. The Client’s requirements were for the team to create a multi-use recreational facility meeting the needs of all its users. The Club provided the essential components, a bar and restaurant, golf shop, administrative office, meeting rooms, changing facilities and external parking for all its members with a harmonious relationship between all areas. The project outcome was a new dedicated facility for Mount Juliet Golf Club members which had not been previously provided. Duggan Brothers demonstrated construction excellence, delivering the project on time within budget and to the required standard. 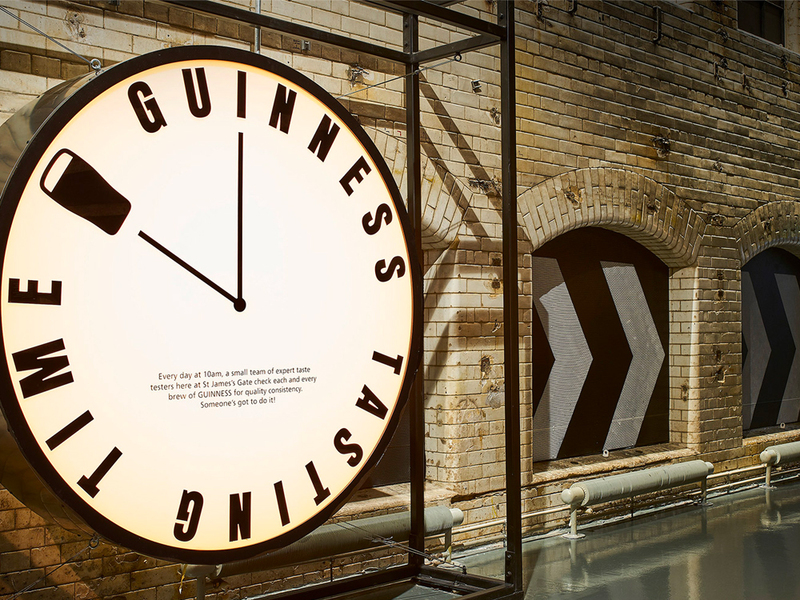 This Townlink Construction project in the Brewing Floor of the Guinness Storehouse involved the remodelling of the first floor to form a new brewing exhibition space. 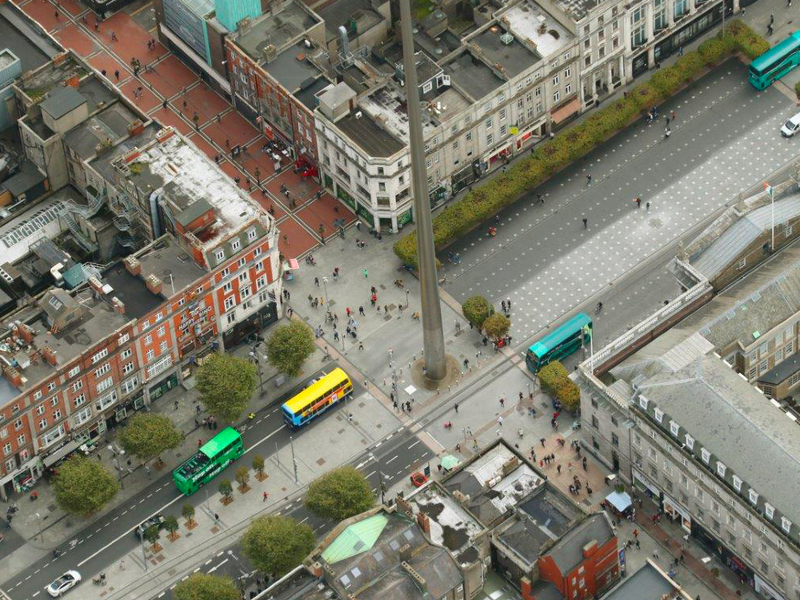 Townlink were engaged early by Guinness Storehouse and invited to participate in the design. Most of the fit out involved development of high quality, complex, bespoke, medium – large scale structures, requiring specialist expertise and testing in the fit out process. The Client’s vision was to create a world-class visitor experience – Townlink brought it to life. The handover was completed on time. All snags had to be complete as part of handover – as the floor was going to be immediately operational. This successful project surpassed the Client and end-users expectations. Tourists on Tripadvisor regularly comment on the smooth flow and the impact of the brewing floor. FiftySevenEast, Kingsland, Dalston, London | Bennett Construction Ltd. The approved scheme was for redevelopment of the site for a residential led mixed use scheme ranging from 4 to 15 storeys of 98 residential units (38 one bed flats; 37 two bed flats; 23 three bed flats) and 1,060 m2 GIA commercial floorspace as well as two disabled car parking spaces, 210 cycle parking spaces, improvements to the public realm and all necessary ancillary and enabling works. The Client is extremely satisfied with the quality of the project, and the level of finishes achieved throughout. This project is now used as the Client’s “landmark” building whereby they use the development as a standard setter for future projects. Britannia Point is one of the best-known landmarks in Colliers Wood, London. The Client’s brief was for the conversion of this disused 17 storey office block to a residential development for the private rental market. The finished building consists of 182 apartments, ground floor retail units and extensive landscaping works which have been coordinated with Merton Council. 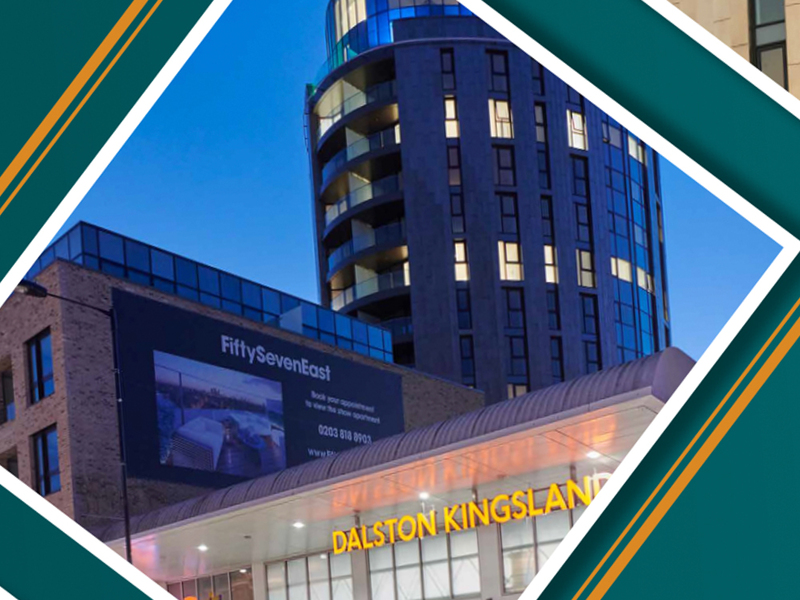 This development has completely changed the skyline and daily lives of those who reside, work and visit Colliers Wood and in fact London as a whole. This project necessitated a very close and collaborative working relationship between JJ Rhatigan’s team, the Client and the design team. This is the kind of relationship JJ Rhatigan endeavours to nurture with all their clients at home and abroad. Ardmac were awarded the fit out of a large data centre project in the Netherlands which was completed in 2017 – the project involved the specialist interior architectural fit out of four large data halls connected by loading and receiving areas, with four separate ancillary buildings and office space for management. 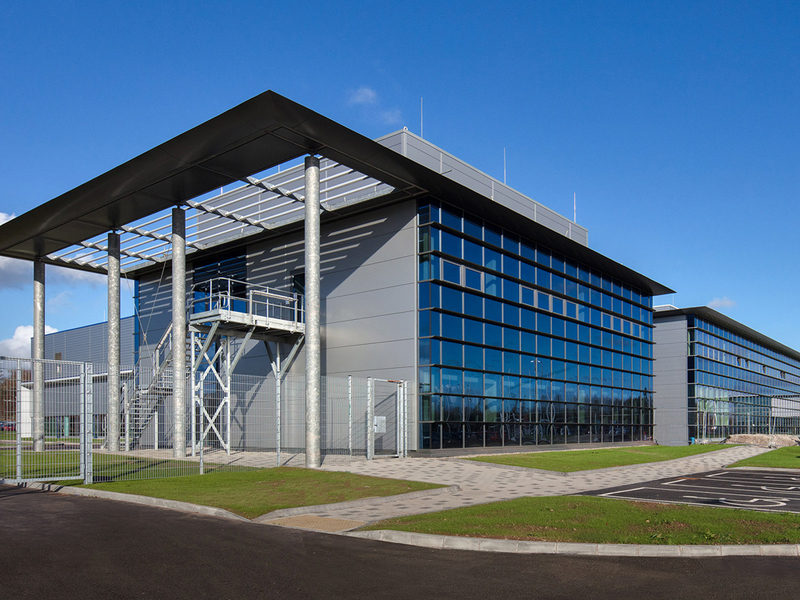 With an integrated project management team Ardmac worked closely with the Client and architect to deliver the 30,000m² hyperscale data centre facility within a 32 week programme. Standards that were achieved on this project included a snag-free handover and no lost time injuries on the project. The new facility delivered a positive outcome for the Client, the project was delivered on time, on budget and injury free. 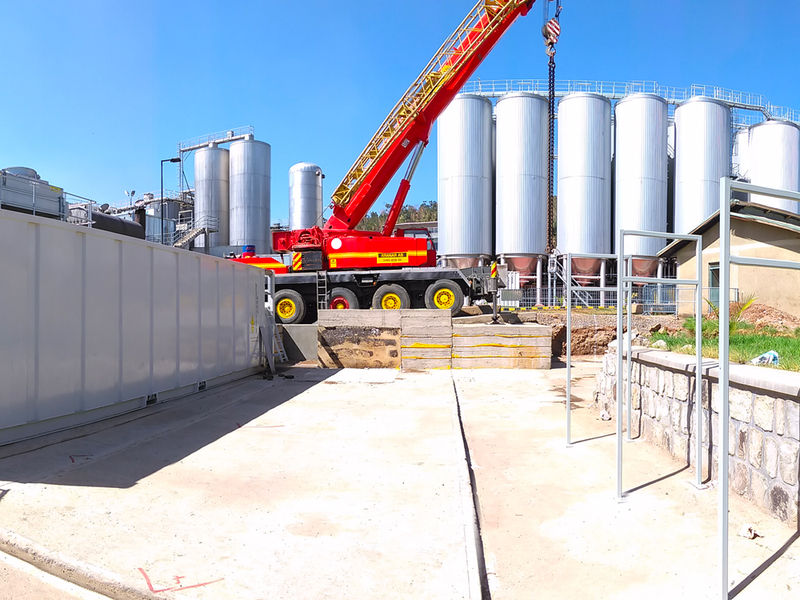 Designer Group was tasked with the construction of a brewery in a remote location in Kenya. Due to the geographical location of the project, the aim for Designer Group was to build up to 80% of the brewery inside specially designed shipping containers in Dublin. The containers will be assembled into a brewery on arrival in Kenya, perhaps the world’s first ‘plug-and-play brewery’. This project has less rework onsite and less waste due to the utilisation of offsite fabrication and reduced project programme onsite due to early engagement. Installation was generally right first time due to the early design review. The containers prefabricated in Ireland were critical to this project. 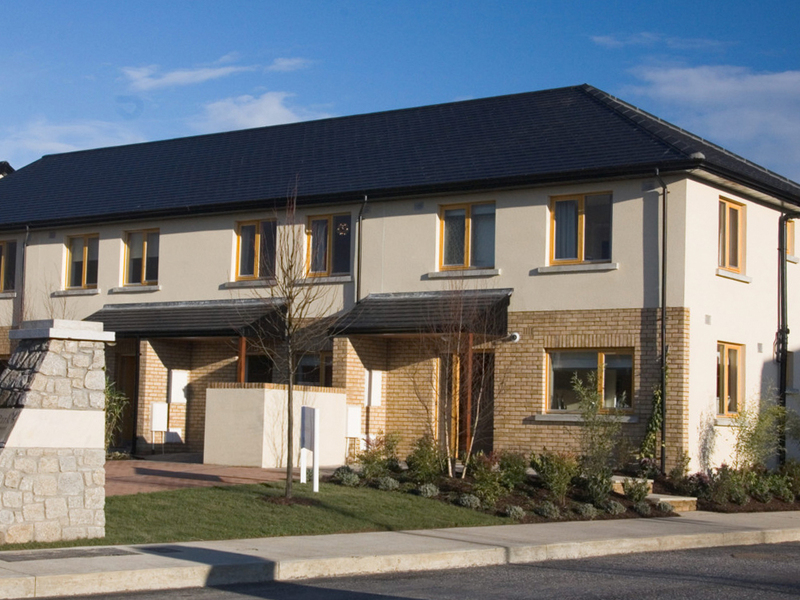 For the Cherry Orchard project in Ballyfermot, Dublin City Council requested the provision of 24 two storey rapid delivery housing units consisting of 12 two-bed and 12 three-bed units. There was a great housing need in the area and time was of the essence. Adston delivered a superior quality modular home that was completed in 50% less time than the traditional build. Adston delivered two houses per week to the site and completed the 24 homes in half the time of traditional build. Factory-built, tested and approved systems, delivered on time. The Rapid Off-Site System Build (ROSSB) was used by Alanna Homes for a residential project of 450 units at Hansfield Wood. This project consists of both houses and apartments. 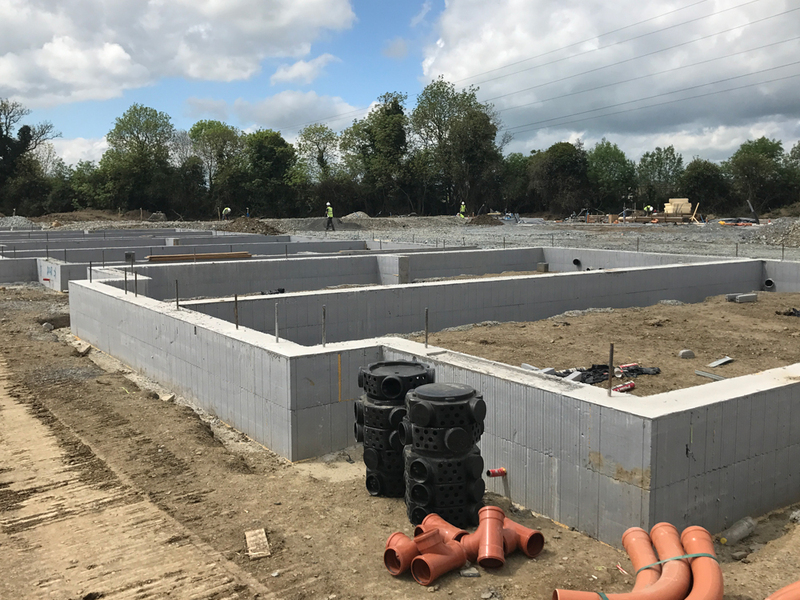 The ROSSB utilises the Alcrete Pre-Cast concrete system where walls are manufactured in the factory and transported and erected on site allowing for a fully sealed unit within 10 days of foundations being laid. Using the ROSSB method allows a house to be built within a 6-week timeframe. The economies of scale on the project see cost saving running at approximately 6 to 8% with continuous re-evaluation, re-sequencing and re-engineering during the course of the project, speed of delivery and certainty of delivery. 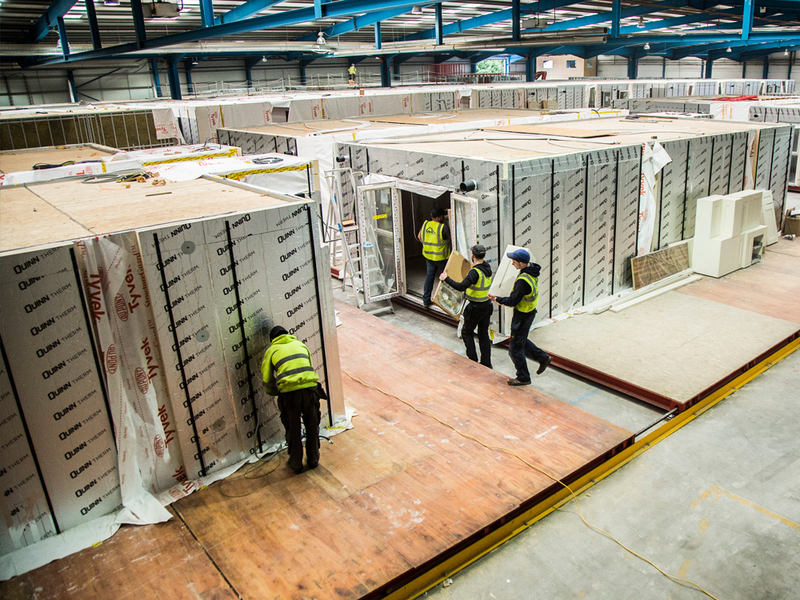 MHI manufacture ultra-high quality offsite volumetric residential units for the Irish and UK markets. Their current output is up to 10 full dwellings per week, which are 80% complete leaving the facility. This gives their clients a distinct quality and time advantage over traditional build methods, with completion works from installation to handover typically taking just 4 weeks. MHI have invested heavily in technology, people and processes and use a robust NSAI certified factory production control system from design through to manufacture. This innovative and industry-changing build process has also been awarded Irish Agrement Board accreditation. At Collen Construction, Health & Safety forms an integral part of the company’s day to day operations and they operate a strong robust safety management system. Their Safety Management System has achieved an ‘’A’’ Rating with the CIF’s Safe-T-Cert Accreditation at A-Grade Rating for the past 7 consecutive years and in 2016 they attained accreditation with the NSAI to the ISO and OHSAS standards. Collen’s excellent safety management system was acknowledged at the 2017 NISO 26th Annual Occupational Safety Awards when they collected the Regional Award East accolade. Collen adopts a positive approach to creating an environment that helps people make healthy choices. Collen believes that a healthy and fit workforce is essential to ensuring a company remains efficient and profitable. The company and staff share the responsibility for wellbeing within the workplace. Managers in the company can create and support an environment where staff can be healthier through providing information and access to schemes and initiatives to improve health & wellbeing at work. 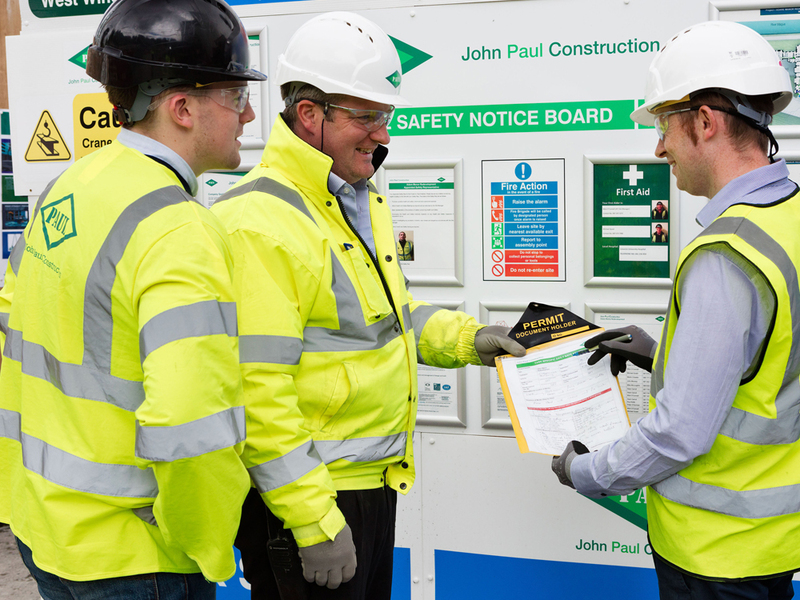 John Paul Construction is an industry leader in the areas of health, safety and wellbeing. 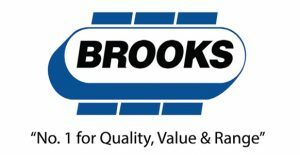 The company’s management systems are accredited to OHSAS 18001 and ISO 14001 by the National Standards Authority of Ireland and they have achieved numerous recognition awards including NISO Higher Distinction and Consistent High Achiever awards in 2017, RoSPA Gold Medal in 2017, NISO All-Ireland Supreme Award 2016 and All-Ireland Occupation Health Award 2016. The company’s WORKSAFE – HOMESAFE behavioural safety programme is developed to enhance their management systems and create a safe work environment where every worker goes home safely each day. The programme aims to change people’s attitude to safety and through positive communication and engagement encourages greater involvement in health, safety and wellbeing by all. John Paul Construction operates various health and safety initiatives across all sites with specific emphasis on health and wellbeing. Sisk operate a Health and Safety Management System which is externally accredited to OHSAS 18001:2007. It is the belief of John Sisk & Son (Holdings) Ltd that zero incidents, zero injuries is achievable. This principle underlines the company approach to Health & Safety in the workplace. Sisk think that to arrive at work with the possibility of being harmed or injured is wholly unacceptable. This belief runs through everything that Sisk do. Sisk have invested in a programme of initiatives to engage every single member of their site teams. Sisk’s journey to zero was not only about safety, zero is a philosophy to deliver construction excellence. Safety is Jones Engineering Group’s number one project value. They are committed to establishing and maintaining a pro-active safety culture. From the Managing Director down they commit themselves to a goal of zero accidents, aiming to ensure “Nobody Gets Hurt”. This commitment extends across the 11 countries in which Jones Engineering operates, including Ireland, UK, Sweden, Finland, Denmark, Holland, Belgium, Saudi, Qatar, UAE and Bahrain. Their Safety Management System, includes: Training as a Key Objective; Safety Initiatives; Rewards and Continuous Monitoring. Feedback from employees has been very positive. Spreading the message of safety in construction, Jones Engineering Group have brought a few selected subcontractors under their wing and have assigned mentors to them to enable them to install a Safety Management System. Jones Engineering Group are leaders in safety and won the top safety award at the National Irish Safety Organisation Awards 2017 – Supreme Award which endorses their excellence in Safety Management Systems and implementation. 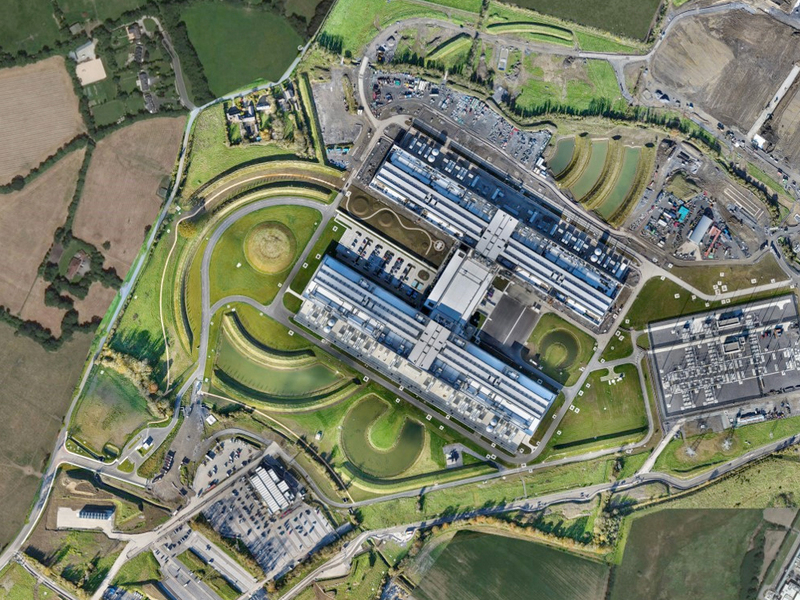 Mace recognise that controlling risks on the Data Centre project in Clonee required a robust safety management system, one that is based on high standards of leadership and accountability supported by effective mechanisms that record trending events with appropriate feedback and improvement processes. Thereby developing a positive, trusting, and open safety culture. Mace pride themselves in leading the way for wellbeing in the construction world, as people are their most important asset, both those working directly for the project and those they work with indirectly. 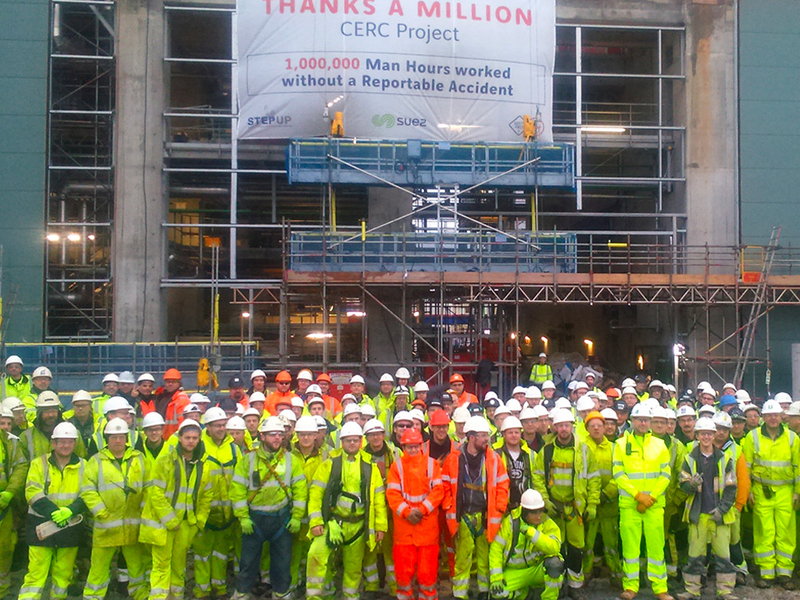 To date, Mace have worked just over 5.1 million man-hours on the project, recording one reportable accident. Overall they have achieved 2.7 million man-hours accident-free prior to the reportable accident and are currently at 2.4 million man-hours, accident-free and counting. Mace believe that in challenging the norm and consistently improving standards through initiatives like the ‘Visual Standards’ campaign and POV(point of view) videos and ‘Wellbeing Week’ they can continue to deliver a world-class project of this scale, to the highest standards in health, safety and wellbeing. 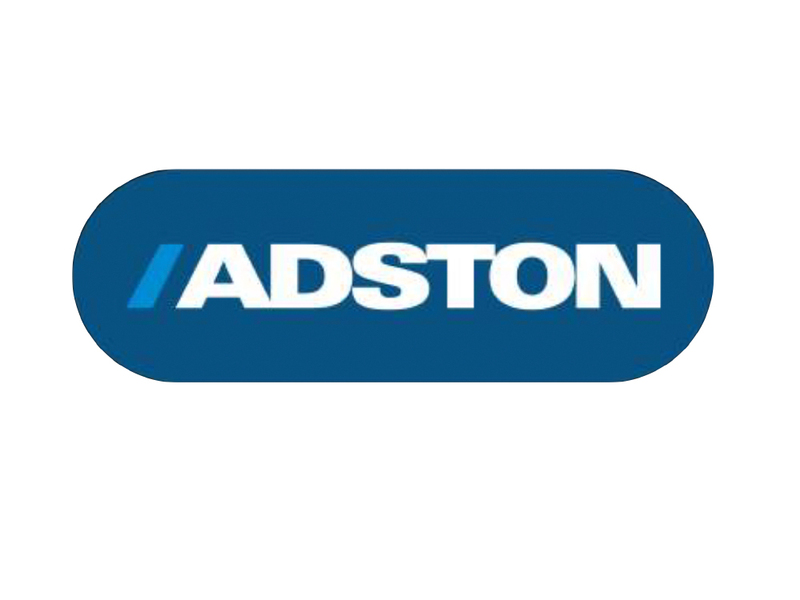 In 2017 Adston implemented an integrated management system (IMS) which is a central point to control the way health and safety is adhered to throughout the company. Health and Safety is driven from the top down with Directors engaging from board level down, stipulating that Health and Safety is a number one priority. 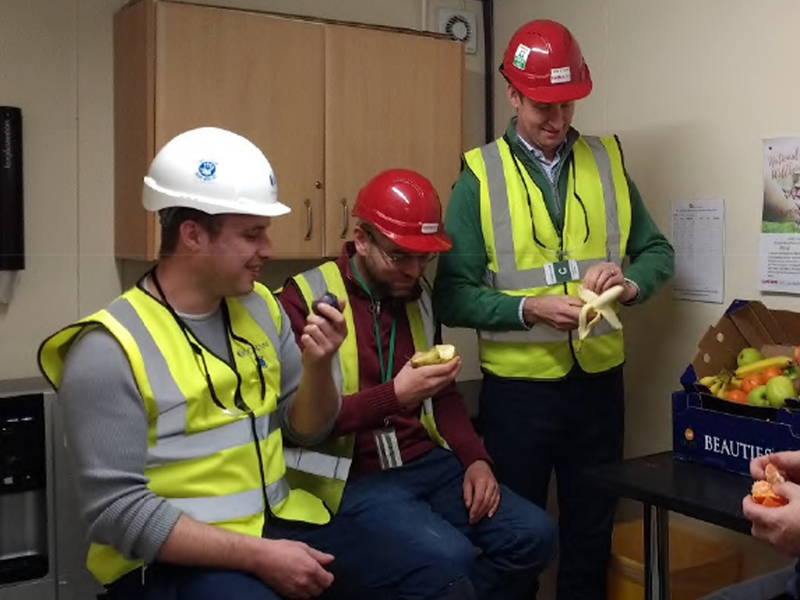 During Construction Safety Week 2017, as part of their approach to Health and Wellbeing, Adston highlighted the five steps to wellbeing. The purpose of this was to raise awareness of the importance of health and wellbeing to employees and to recommend actions that will improve their health in the workplace. Adston’s Safety Management System includes Health and Wellbeing and under the new manager several new targets and objectives have been set for 2018 including the rollout of wellbeing health days for all employees; wellbeing clinics, which will offer blood pressure checks, blood glucose checks; and BMI indicators. 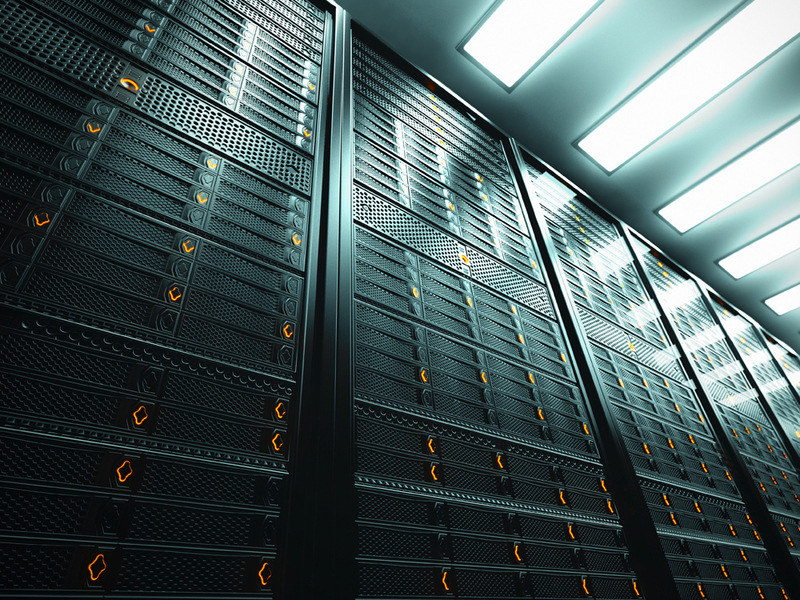 The development of a large data centre campus was awarded to John Sisk & Son (Holdings) Ltd. as General Contractor (GC) by a multinational client. This multinational data centre project has been designated as the pilot scheme project of BIM best practice for any future data centre projects for this client. It will be used as a benchmark project to record benefits and successful practices resulting in efficiencies in the full life-cycle of the facility. The Client can already see the future benefits they will have when provided a data rich Asset Information Model (AIM) at handover. 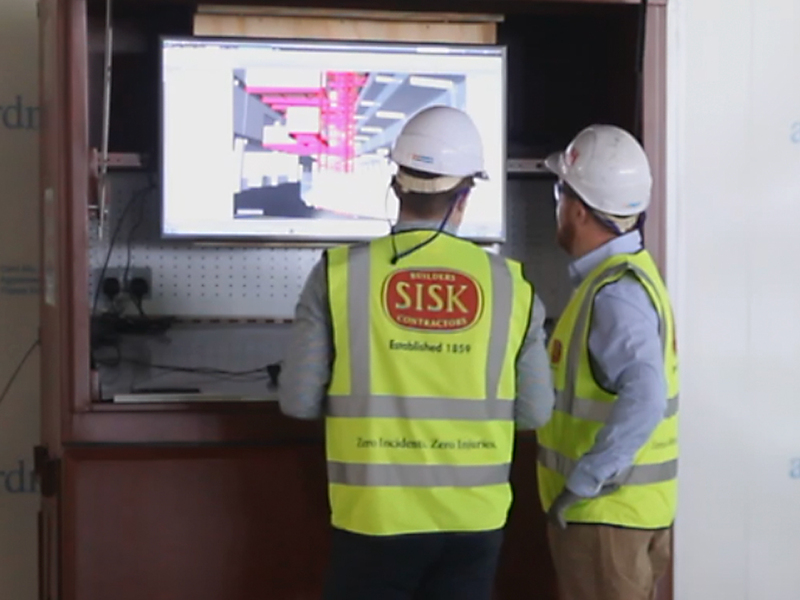 Sisk, in conjunction with RKD have demonstrated their BIM Process and Strategy to the Client’s Design Team and general contractors from around the world. 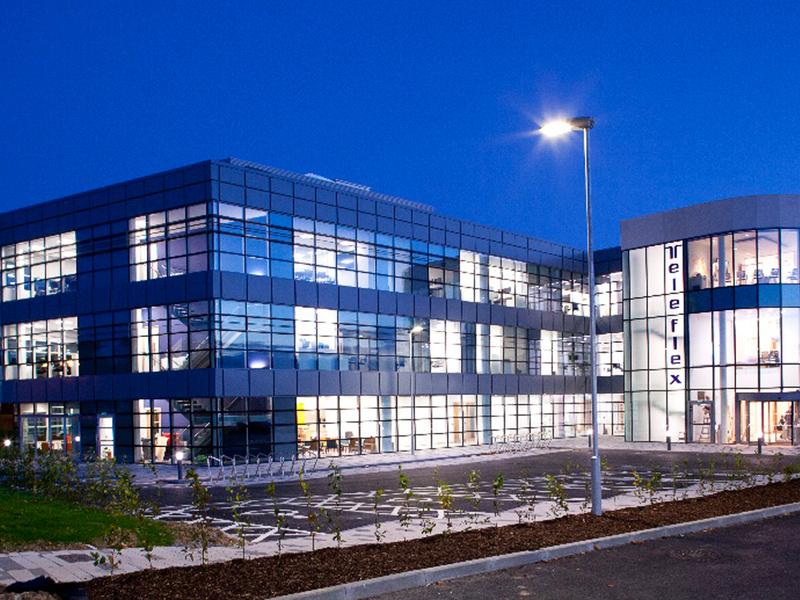 The Clonee Data Centre is currently viewed as the leading project for BIM innovation in the Mace portfolios. Implementing BIM relies on a philosophy of project team communication and collaboration. Working closely with their Client, the Mace team at Clonee concentrated on two key goals, model management (with emphasis on tying the design review process into the construction programme), and field management (with emphasis on using the data collected in the field, to help achieve the project milestones). Due to automated workflows and the use of APIs, Mace has a live and transparent view of all clash reports and coordination issues, as well as snag counts and O&M information hosted on a centrally located project website. This increases project progress visibility, identifying root causes and mitigating risk in the programme. BIM workflows and procedures at the project were created with lean thinking, alongside modularised construction innovations. Data Halls C&D were handed over with zero defects with all O&M associated documentation issued to the Client in advance of practical completion. Mace is now sharing best practise on BIM innovation and implementation with the Client and contractors across the Client’s global supply chain. The Kerry Regional Water Supply Scheme was a Design, Build and Operate (DBO) contract for Irish Water, the design, both at tender and contract award stage, was Glan Agua’s sole responsibility. The project brief was the construction of a 51,000,000 litre per day water treatment plant. Glan Agua’s BIM philosophy for the project was to drive efficiency and value engineering for the Client throughout the project through the use of BIM Processes and Tools. 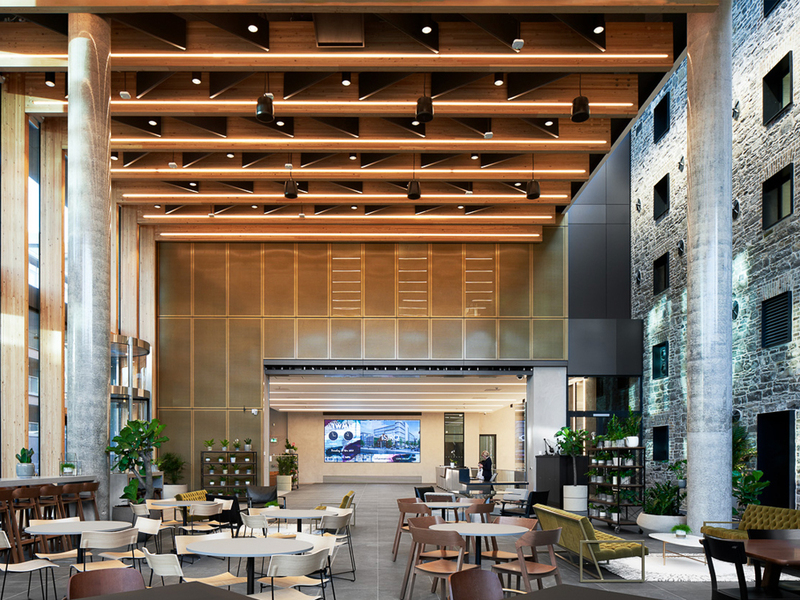 Utilising the BIM model, design coordination was greatly enhanced, allowing for all disciplines to work together closely and coordinate activities. In terms of construction, BIM helped to provide full visualisation, better project planning, better cost control and better programme management. 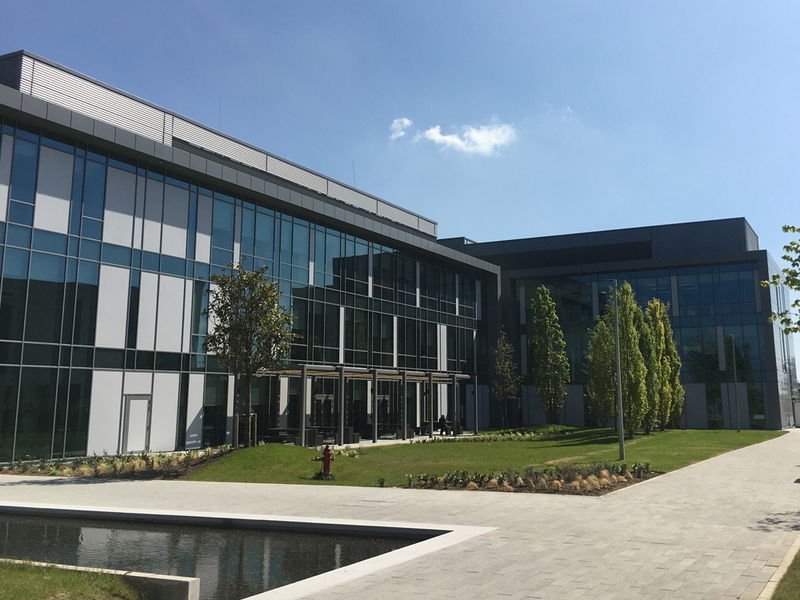 The LOC Building in Blanchardstown for global BioPharma company Bristol-Myers Squibb, which consisted of a multi-storey laboratory and administration building. Designer Group utilised digital technology to successfully complete the electrical installations. Designer Group had a peak of over 200 staff onsite, and successfully utilised BIM processes and standards. They developed, managed and coordinated the BIM model using BIM software. 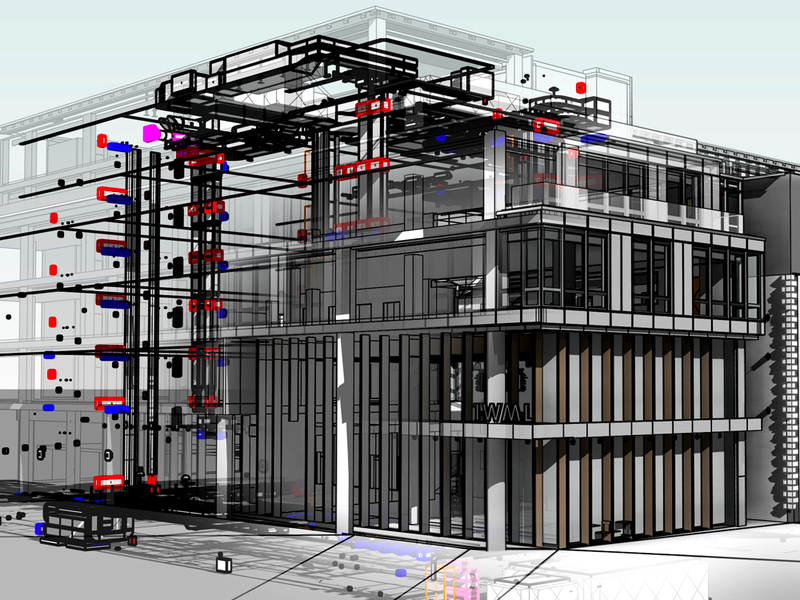 The distinguishing factors and major successes on the project that demonstrate BIM excellence were the development of custom-built software to meet project deadlines, early contractor engagement leading to the building been redesigned and ensuring constructability of the model, upskilling of all project team members to utilise BIM software and align to processes. The Museum of the Future aims to create a permanent centre to engage the public in different conversations about what the future might look like. This $200 million, 30,000 m2 iconic building will have an instantly recognisable form like no other, epitomised by its futuristic stainless steel facade, integrated with illuminated glazed Arabic calligraphy. There is no project that epitomises the leading edge of fully digital project delivery in the Middle East than the extraordinarily complex design of the Museum of the Future. 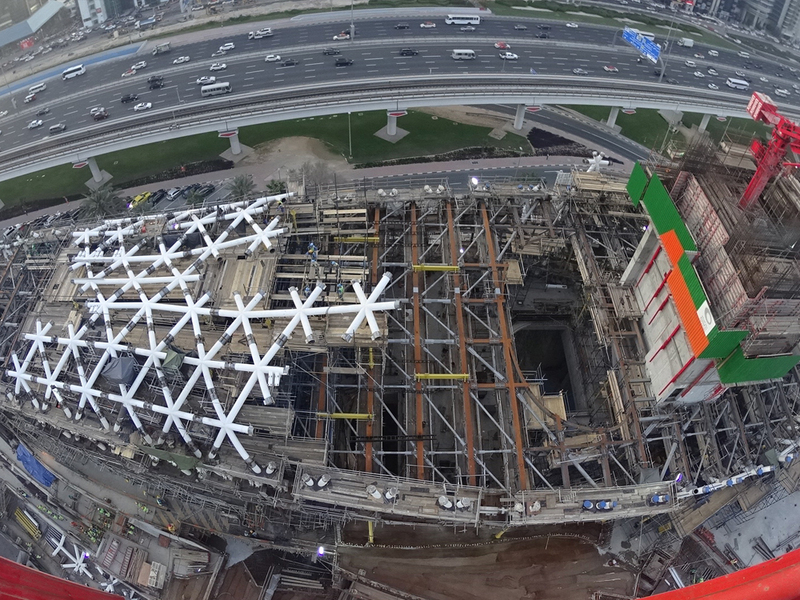 Without BAM’s experience in BIM led projects and 3D integrated elemental design modelling, this project would not have been possible to coordinate between the main design and engineering disciplines including surveying and the information for construction to the contractor and the supply chain. The primary BIM deliverable on the project was a fully federated object-based construction BIM and AIM (Asset Information Model), which Hibernia REIT could utilise for the facility management phase of the building lifecycle. The AIM was to be data rich with associated digital asset information in COBie format, using Uniclass classification, with construction, fabrication and installation drawings derived as far as practically possible from the models. Dublin Institute of Technology (DIT) has an MSc in applied Building Information Modelling & Management (Level 9 major award) with embedded Postgraduate Diploma in Collaborative BIM (Level 9 major award) and Postgraduate Certificate in BIM Technologies (Level 9 minor award). The term “the MSc in aBIMM suite” is used when referring to all exit award types. The course’s purpose is to educate professionals in a multidisciplinary setting to enable them to undertake roles as BIM technicians, coordinators, and information managers with specialist contractors, general contractors, designers, facility managers, and clients and their representatives. The course is available at DIT’s Bolton Street campus with significant online support and collaborative working. 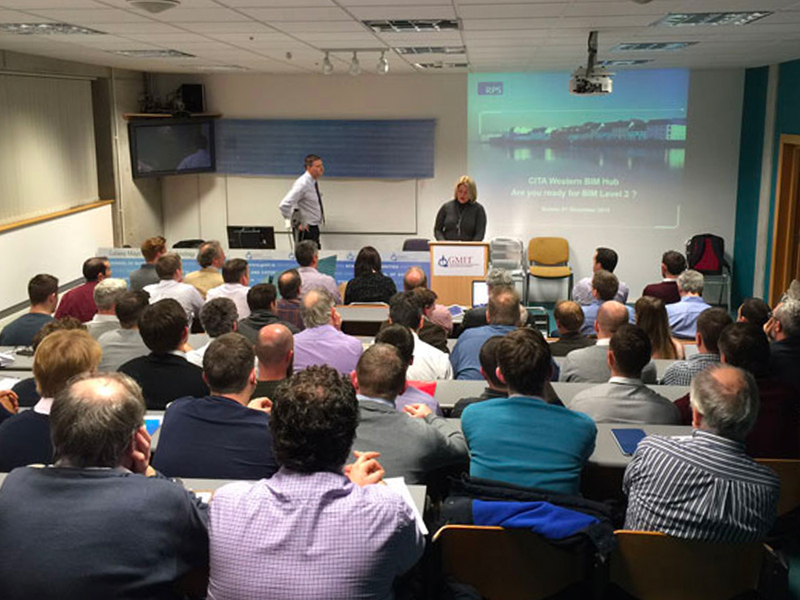 The Galway-Mayo Institute of Technology (GMIT) Higher Diploma in Engineering in BIM is addressing the need for leadership in this transition by using innovative pedagogical approaches in an interdisciplinary learning environment to address competency and skill gaps in the industry. The total cost of the course is €5,000. The course is available to all stakeholders working in the construction and built environment sector. A reciprocal learning framework has been developed to merge industry best practice and feedback, curriculum innovation and evidence-based research into a set of learning resources for the course. Over 100 RPS Group staff have been upskilled since 2013 with 18 graduating from the Higher Diploma in Engineering in BIM in 2016 and 2017. Since September 2016, 68 non-RPS industry stakeholders have commenced the course in GMIT. Course: IT Sligo’s Online MSc in Project Management- addressing industry skills gaps in Project Management, BIM and Lean Construction. The Online Part-time Master of Science in Project Management is a new Level 9 award. This course incorporates the already successful Post Grad Certificate in Project Management as an embedded award, which has ran since 2012. In addition, new construction focused embedded Special Purpose Awards (SPAs) have been created such as the Post Grad Certificate in BIM and Lean Construction Management, Post Grad Certificate in Strategic Construction Management and Post Grad Certificate in Procurement, Law and Contracts. A graduate who completes an SPA gets exemptions if they progress onto the MSc course, which provides excellent and flexible progression pathways for learners. 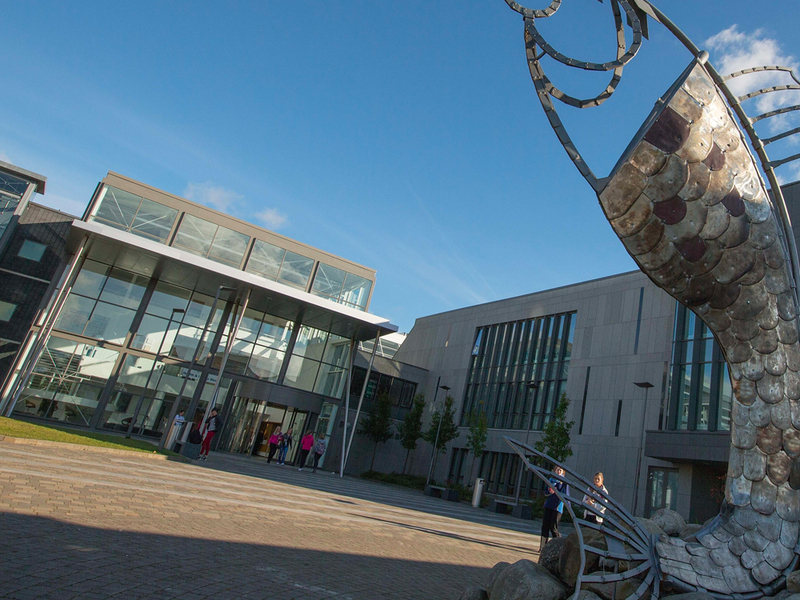 Already the leader nationally in online education, IT Sligo has high recruitment targets and ultimately aspires to be the leader internationally in online Project and Construction Management within 5 years. The course ‘Revit and Level 2 Building Information Modelling’ is available in the Dublin Institute of Design on Kildare Street, Dublin 2. The course is part-time and runs over an 8-week period; classes are lecture-based with practical exercises and project-based, aiming to teach students how to manage BIM models and procedures on a BIM Level 2 project. Approximately 270 people have taken the course since November 2015. Feedback from students has been extremely positive. Each taught element is reinforced by a practical example and students say the course is of excellent quality and provides a great quantity of information. The course lecturers, have fine-tuned the pacing of the course over time as the standards and contracts adapt. ON!Track is a complete asset management system. Designed to manage the location, condition, responsible employee, service and maintenance of all a company’s equipment from vehicles to office chairs. The system can manage all the relevant documentation for employees as well including training and due dates. It is all cloud-based and accessible from an App or Desktop. ON!Track is a productivity tool, affecting areas in the business from stock management, hiring processes, health and safety and many others. The typical mid-sized Irish construction company would have on average 20 hours per month on these areas. 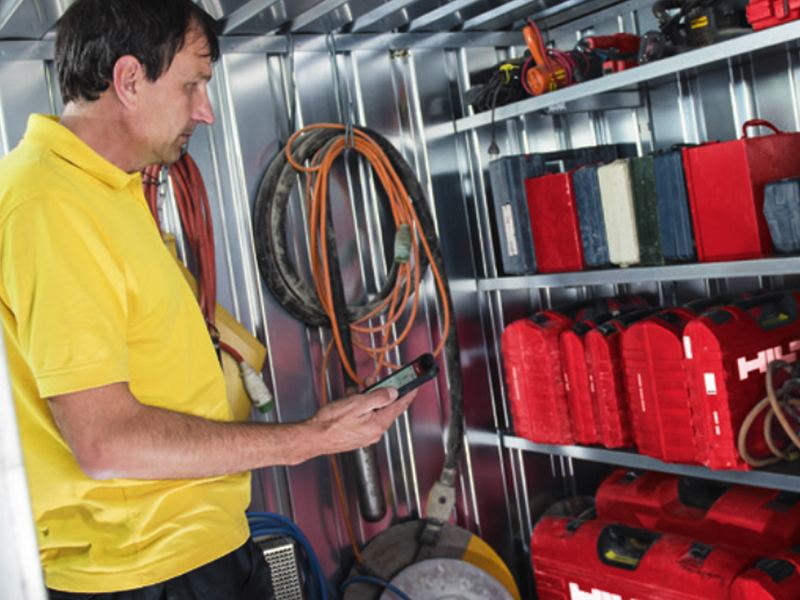 Hilti currently have over 5,000 companies globally using this system on a monthly software subscription fee. 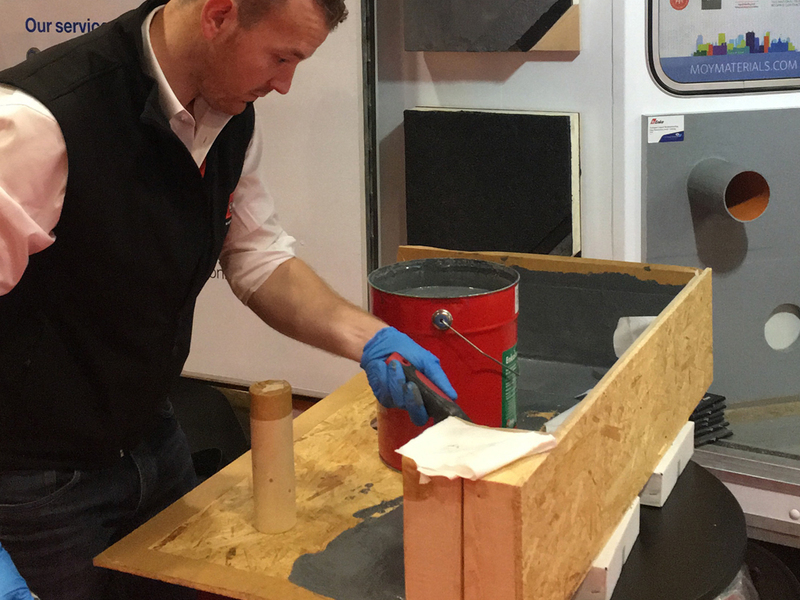 Kingspan Insulation are always striving to improve their products to make sure customers get the best solution for their project. They understand that the industry continues to evolve and so do their products. With that in mind they have revolutionised their rigid insulation technology with the introduction of their Kooltherm lower lambda product range for floor, wall and soffit applications; delivering premium thermal performance with a minimal construction thickness. This new range offers a thermal conductivity as low as 0.018w/m.k. The advanced composition of Kingspan Kooltherm lower lambda products ensures architects and engineers now have even greater freedom to achieve spectacular designs, with inherently outstanding fabric performance, without having to compromise on internal living or working space. 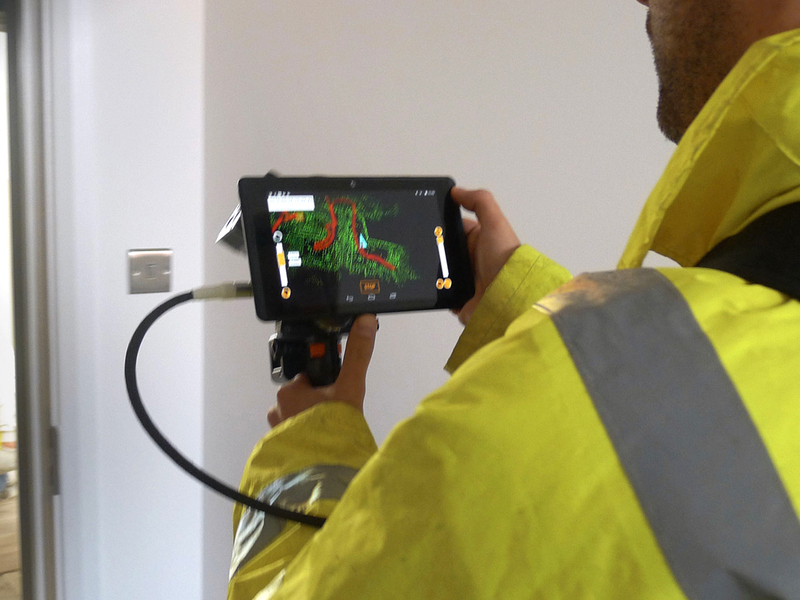 The GeoSLAM Revo is a handheld 3D scanner that will allow the user to walk around site to gather 3D pointcloud data. Data is gathered, registered and processed as you walk around making sure you do not miss any areas with the real time viewer. This can then be used for survey purposes, volume calculations, BIM model creation or for construction verification to name a few applications. The product is manufactured in the UK and is available through Levelling Equipment Services in Ireland. The Revo surpasses the customers’ expectations in the speed and accuracy of the scan data that is produced. 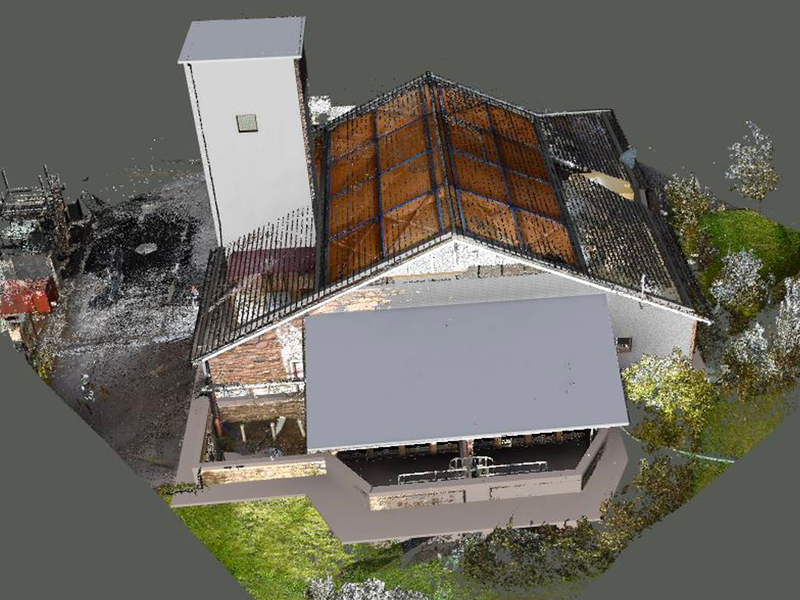 It also allows the user to use Geoslam viewer allowing them to annotate the scan for remarks such as issues on site, fixings to be done and BIM model creation from the scanned data. Leica Geosystems’ BLK360 3D scanner, the smallest and lightest imaging laser scanner ever made, simplifies the collection of as-built reality capture data for work across several vertical markets including construction and engineering. 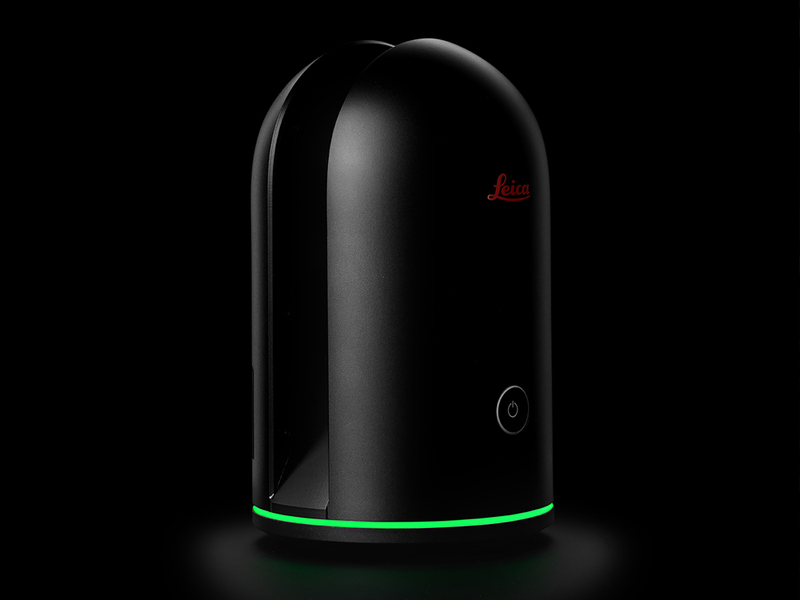 The Leica BLK360 is able to capture real-time data at the touch of a single button, streamlining the scanning process and saving large amounts of time. This portable device allows anyone with an iPad to create a 360 degree image that can be viewed and shared with others in a matter of minutes. The Leica BLK360 is also an industry game-changer as it opens up laser scanning to complete new audiences. 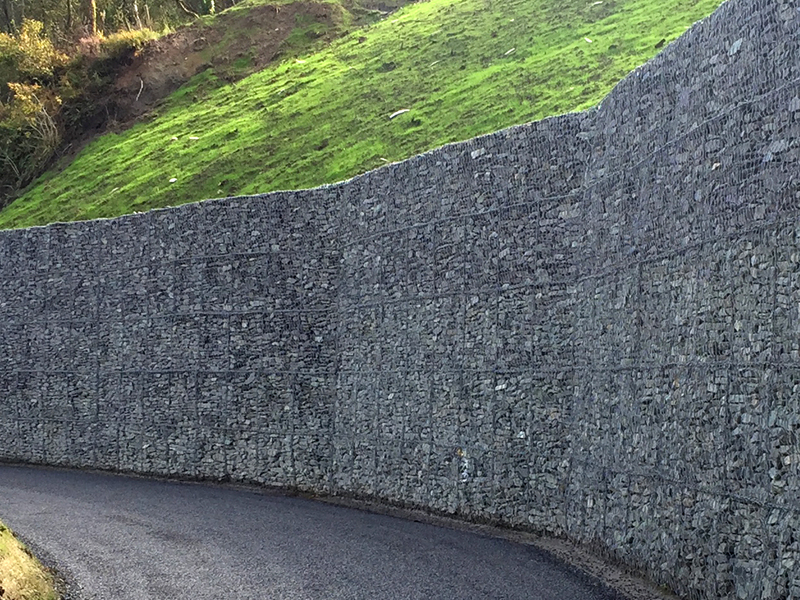 Erosion Control Protection Solutions Ltd (ECPS Ltd) is a Cork-based company formed in 2013 specialising in providing an alternative coastal erosion solution to rock armour. 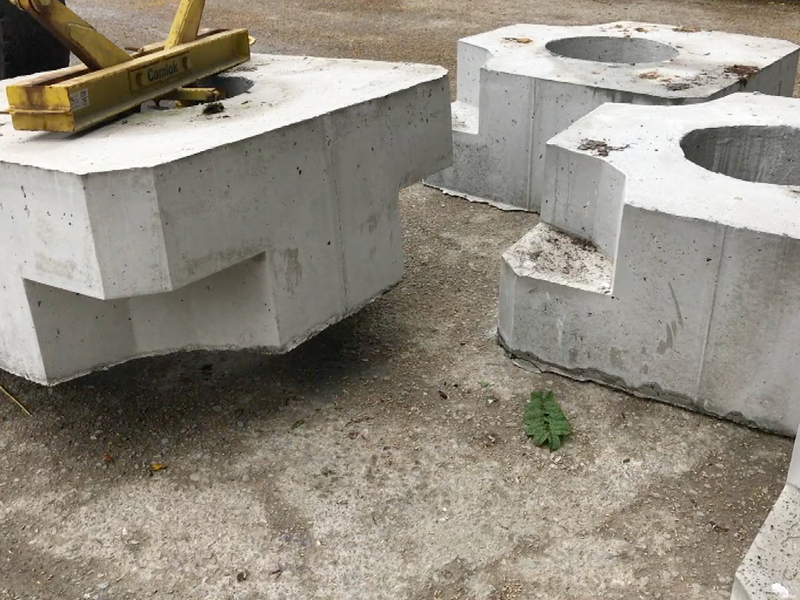 The Erosion Control Armour Block (ECAB) is their product for coastal protection. Erosion and accretion are part of the natural processes that have been shaping our coastline for centuries. Although coastal protection works are nothing new there does seem to be an increasing demand and necessity for such works in recent times. In choosing this technology Cork County Council have become early adopters of this revolutionary technology. The Council’s Garrettstown Beach Coastal Protection Works was completed in June 2017. Enkolan is the latest high performance innovative waterproofing solution launched by Ireland’s leading waterproofing specialists Moy Materials. Developed in 2015 alongside their suppliers Enke-Werk the product has revolutionised the waterproofing industry due to its innovative solvent free formulation. Suitable for a range of intricate waterproofing applications in the areas of flat roofs, balconies and terraces. 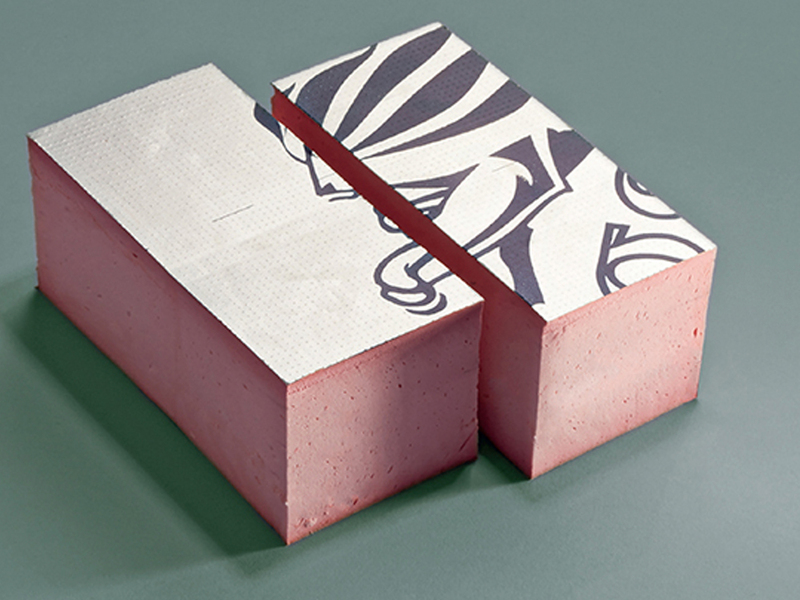 Moy Materials Enkolan will answer the needs of the roofing industry with this odourless liquid waterproofing product. The product launched onto the Irish market in 2016 is part of Moy Materials investment into continuous product research and development. Enkolan is the first product of its kind to enter the market which is solvent-free, odourless and single component. Moy Material’s Enkolan has revolutionised the waterproofing industry making complex and intricate details quick and easy to waterproof ensuring complete waterproofing integrity of your building. The Survipod provides a stable and secure platform for the engineer, enabling them to set out the structure accurately and also preventing costly insurance claims from falling instruments. The equipment used for setting out or surveying a structure can range in cost from €500 to €100,000. Instruments are regularly knocked over accidently. This can result in a large insurance claim for repair or replacement. Using the Survipod removes this risk. Customers have expressed their satisfaction with its reliability and are delighted with the savings on insurance claims which had previously been costly to their business.